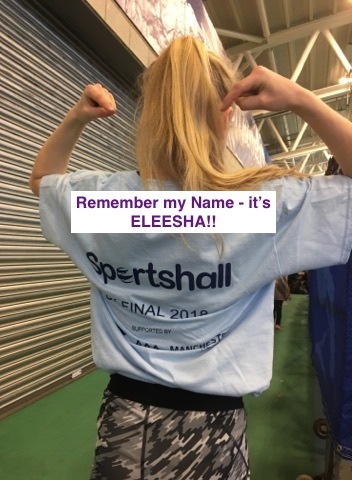 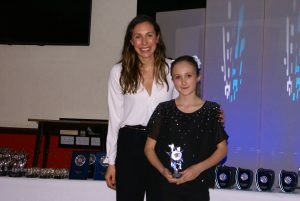 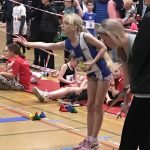 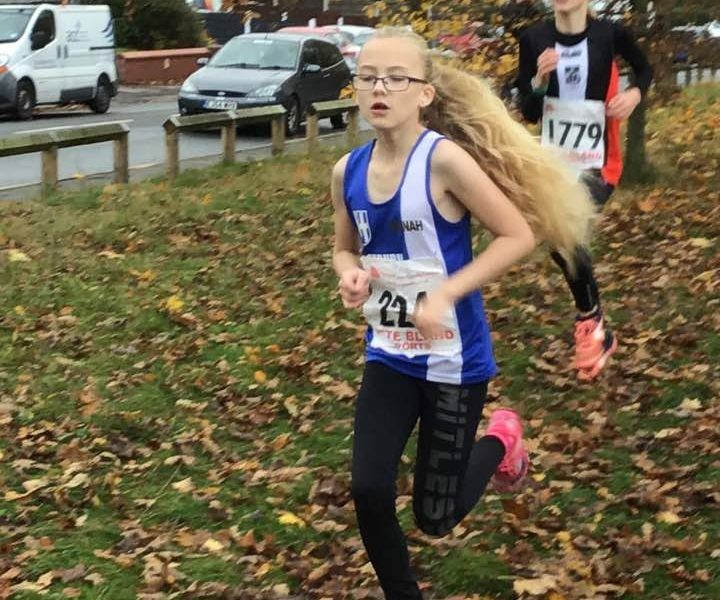 Eleesha Charnley, an U15 young athlete and a member of Blackburn Harriers since she was seven years of age and just a couple of months short of her 8th birthday, recently became the Northern Sportshall Champion which qualified her for the National Championships held at Sportscity. 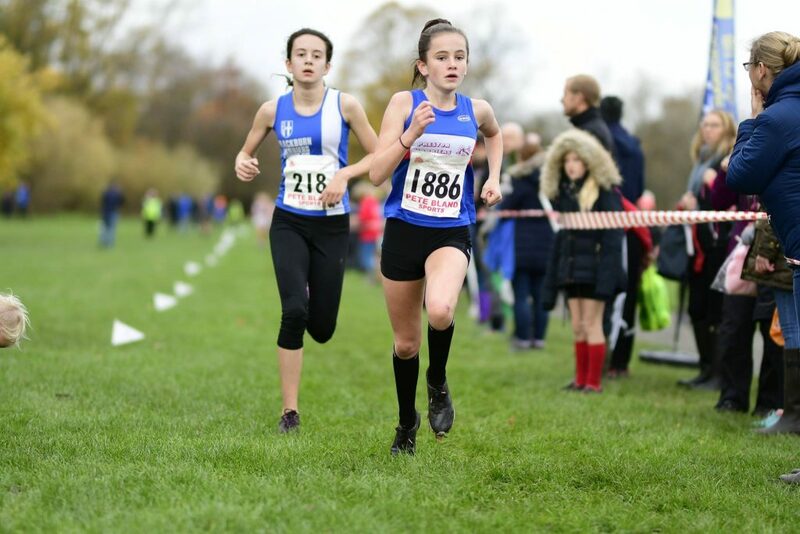 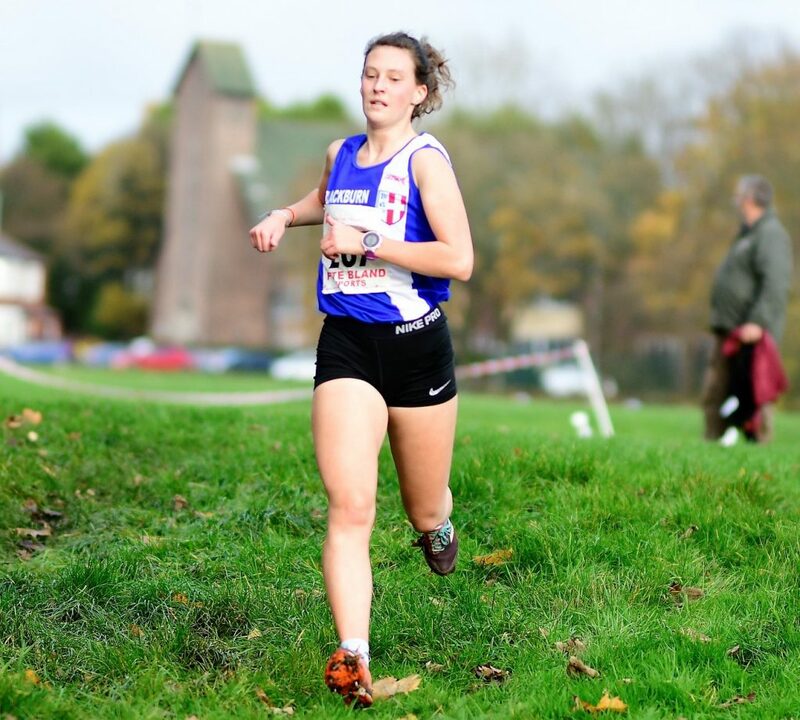 And what a great performance she put in – taking on the 4 Lap Race, Speed Bounce and Standing Long Jump against the other U15 Girls who had qualified from all over the country. 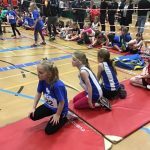 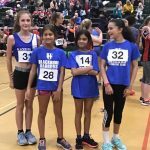 Eleesha finished joint 10th overall out of seventy three athletes – placing 8th in the 4 Lap Race – 5th in the Speed Bounce and 10th in the Standing Long Jump. 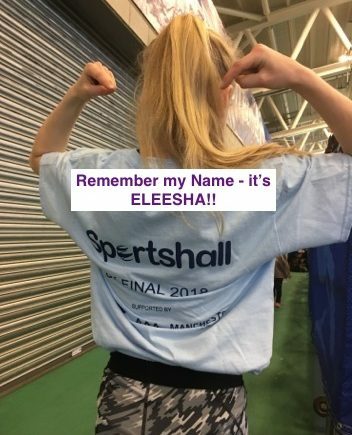 She was delighted with her qualification and performance at the Championship Final and told the Club after that “It was the most amazing experience to walk out at the front of my team carrying the banner. 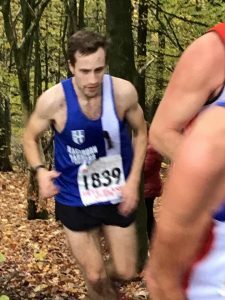 The standard was phenomenal but I felt very pleased that I could compete in such a good field of competitors and give them a run for their money. 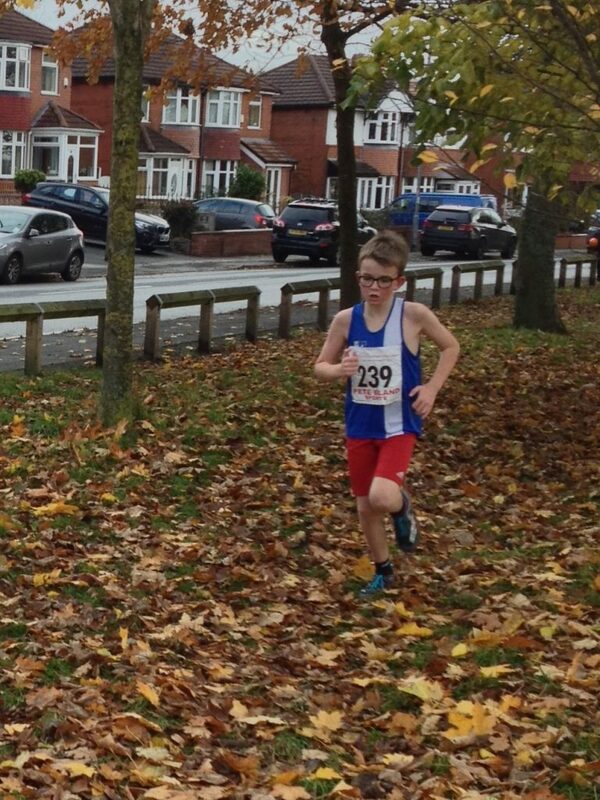 Although I did not get in the the winning medal position it was still great that I could get there. 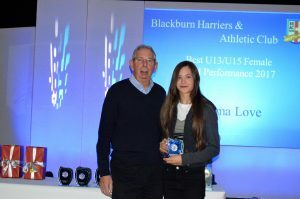 Thanks to Blackburn Harriers once again for making this possible”. 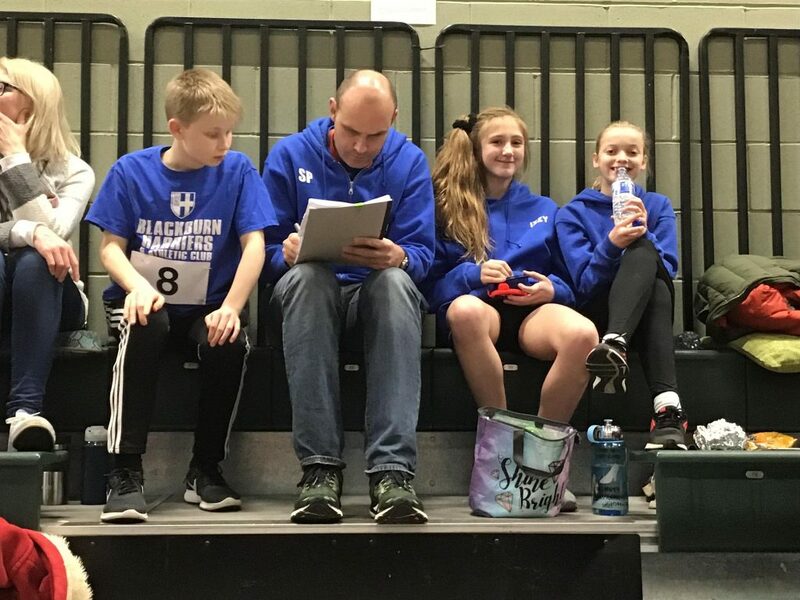 Another very good performance by Blackburn Harriers Sportshall Squad at the weekend taking 3rd overall including 2nd Team in the U11Girls – 3rd in the U11 Boys – 3rd in the U13 Girls – 3rd in the U13 Boys and 4th in the U15 Girls. 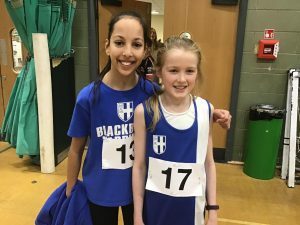 Some of the youngsters posted new personal bests and for the second fixture in a row, the Harriers produced an athlete of the Match – Niamh Gater winning it for the U11Girls, after Harrison Allcock had won the Athlete of the Match for the U11 Boys in the first fixture. 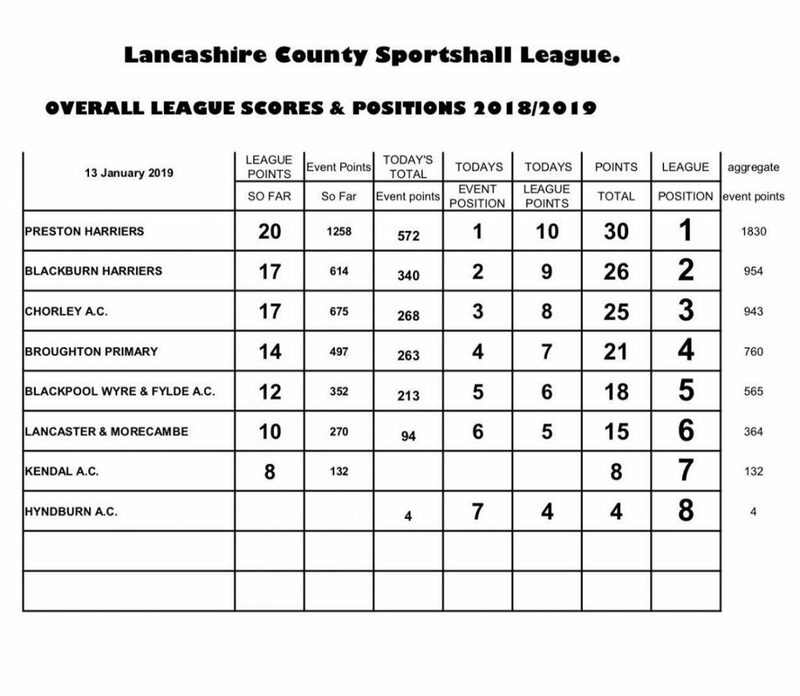 After the first two fixtures the Harriers are in 3rd position overall in the League Table. 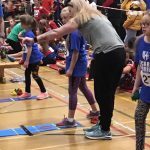 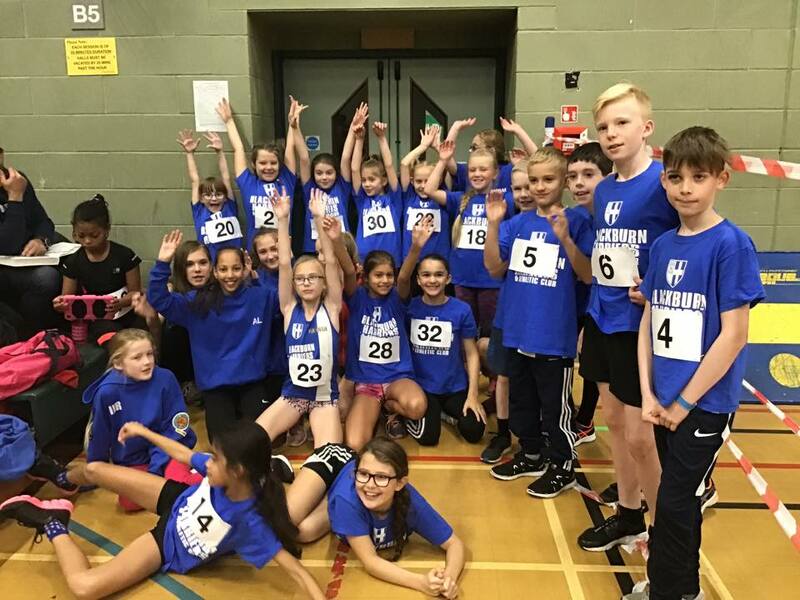 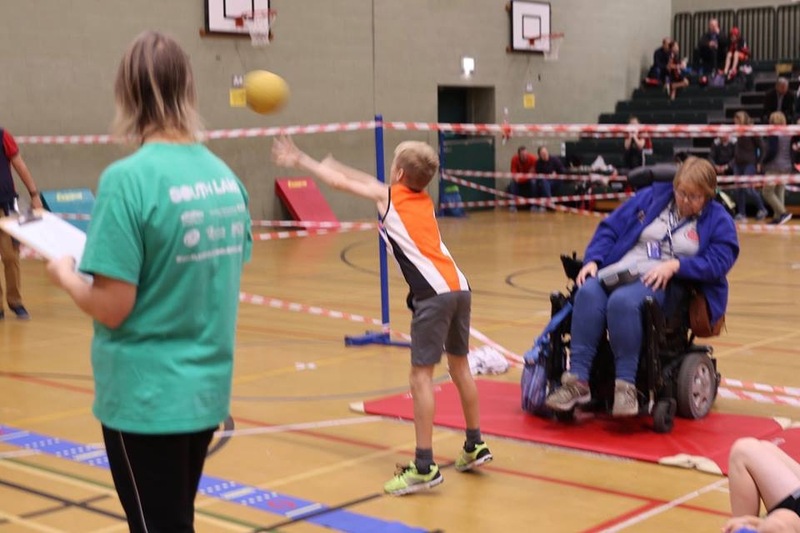 Caerwen Butler commented on the performance of our young up and coming athletes saying ‘Blackburn Harriers had another fantastic turn out for the second Lancashire County Sportshall Event in Blackpool on Sunday 14th January 2018. 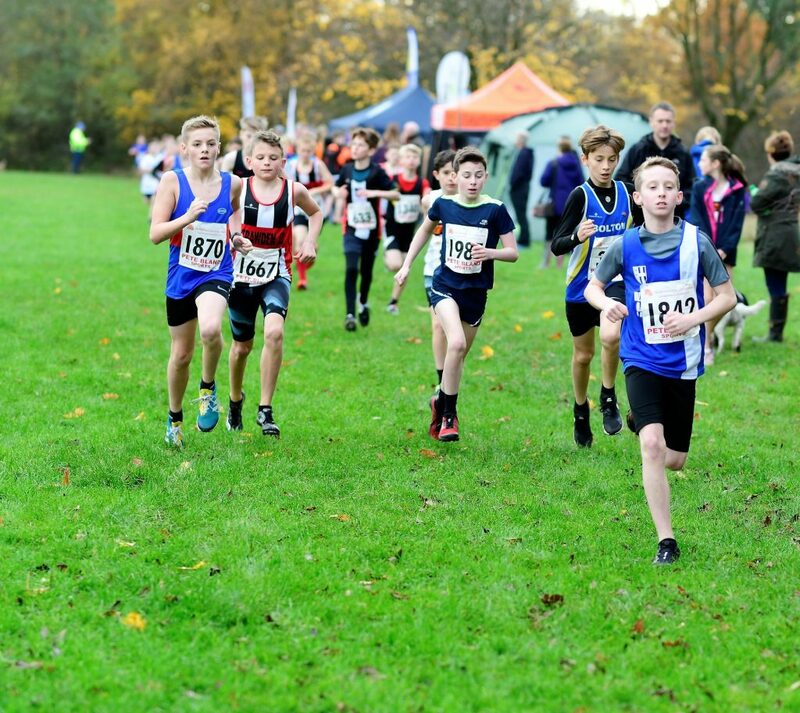 Over 40 athletes competed in every age category apart from one. 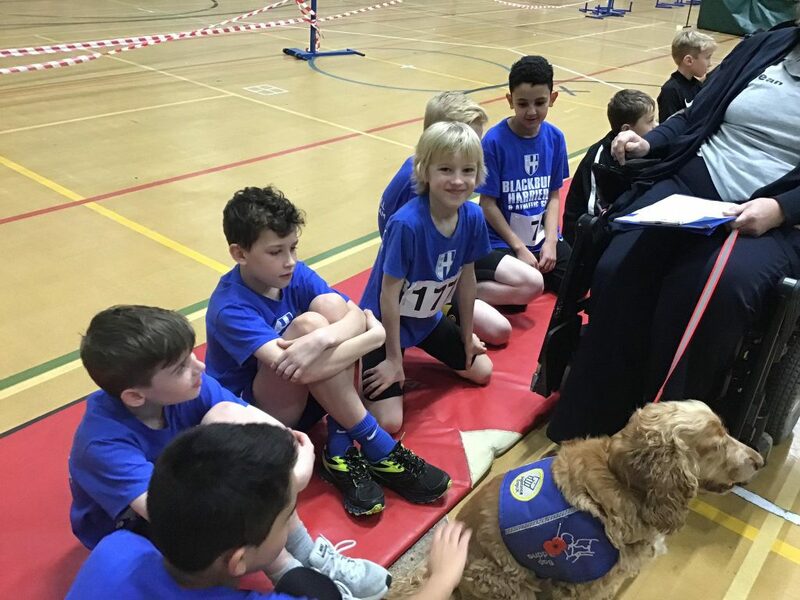 The children were brilliantly behaved and all tried their hardest at each event. 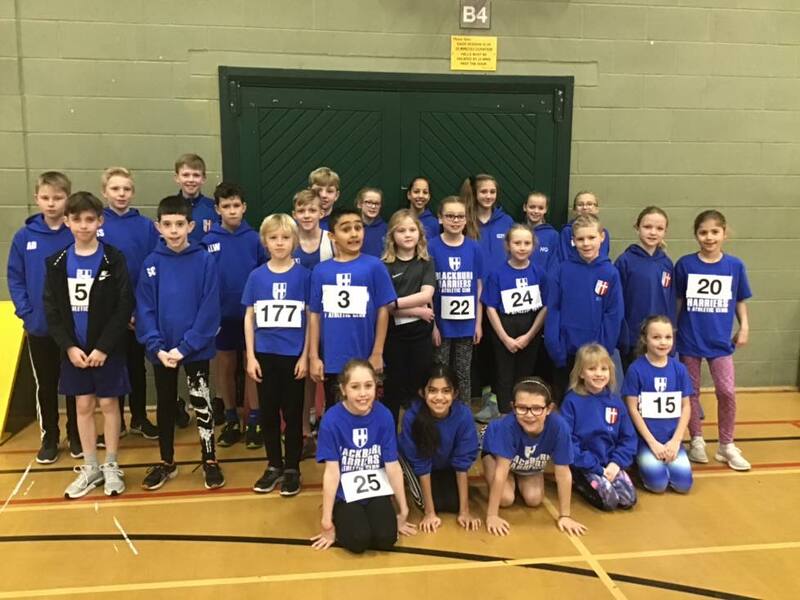 There were lots of individual personal bests and even some club records were broken on the day. 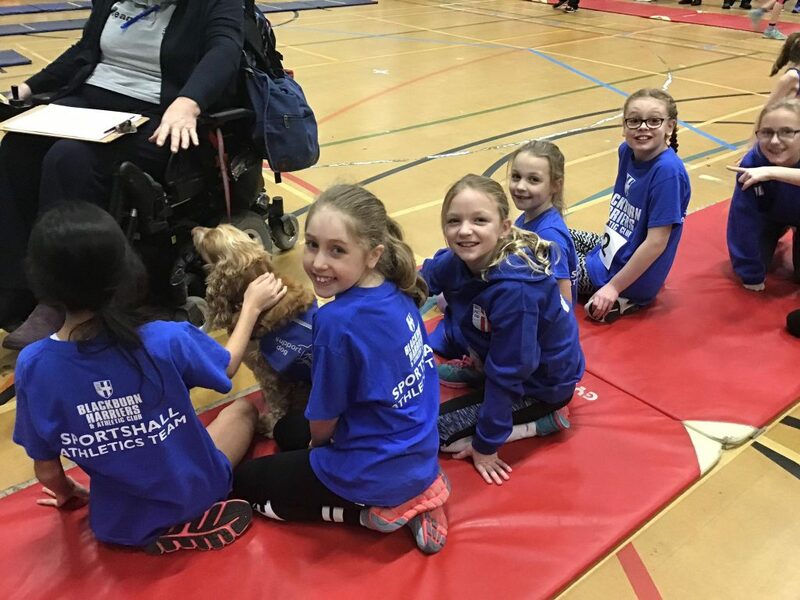 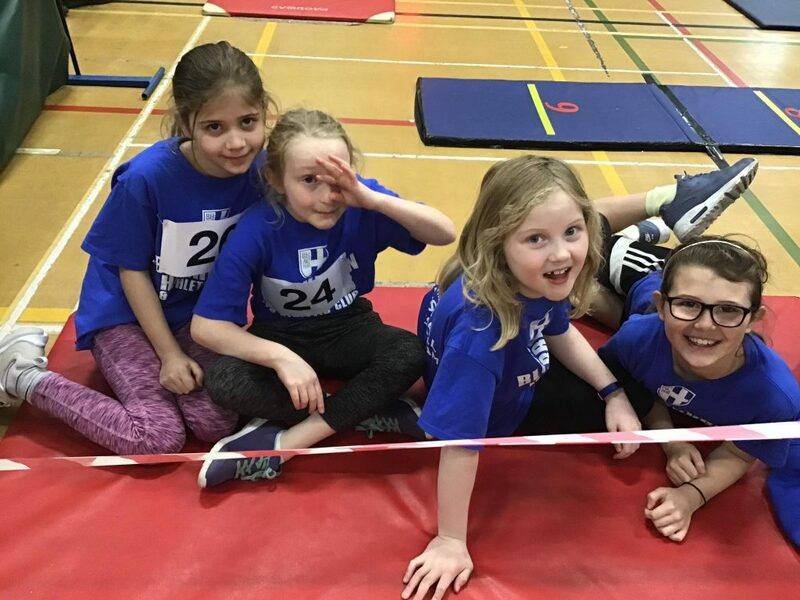 Some younger children took up the challenge in their first competition with a brave and competitive attitude- well done to all those who were there for the first time. 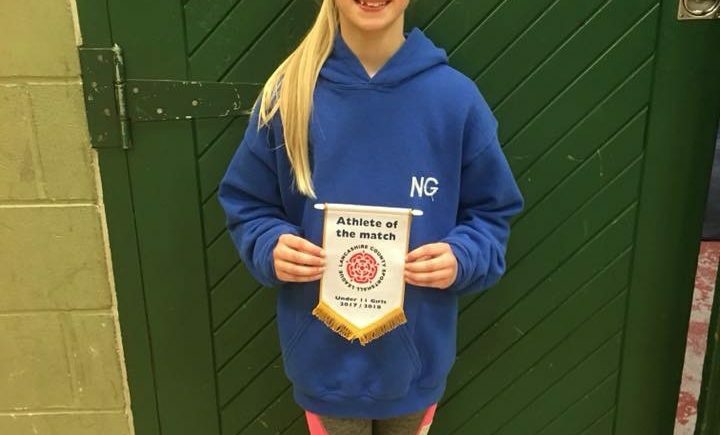 Notably Niamh Gater won Athlete of the Match for the Under 11 girls for the combined total of events scored. 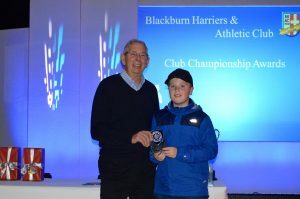 Harrison Allcock won this in November for the Under 11 boys. 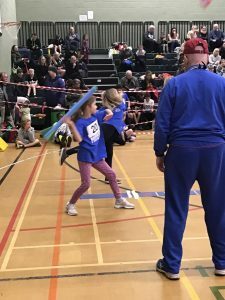 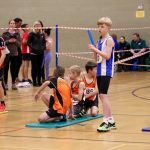 We have some very talented athletes coming through to the Under 13’s next year and had such strength in depth on the day in both the Under 11 age categories. 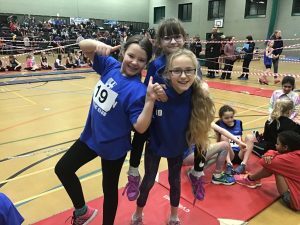 The older athletes competed brilliantly too and with only a handful in each category they still managed to finish in the top 3 in the Under 13’s categories. 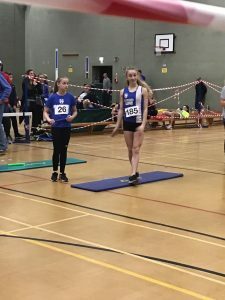 A special mention to Liberty Thompson who gained all the points for the Under 15’s in the individual events and thanks to Claudia Lewis who joined her in the relay and stepped up an age category. 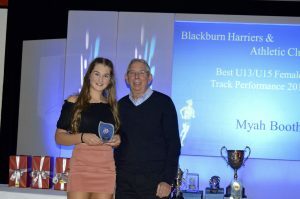 A packed out evening at the Mill Hill Working men’s Club saw Blackburn Harriers celebrate the success of all our athletes over the previous year across all disciplines – Track & Field; Cross Country, Road, Fell and Sportshall. 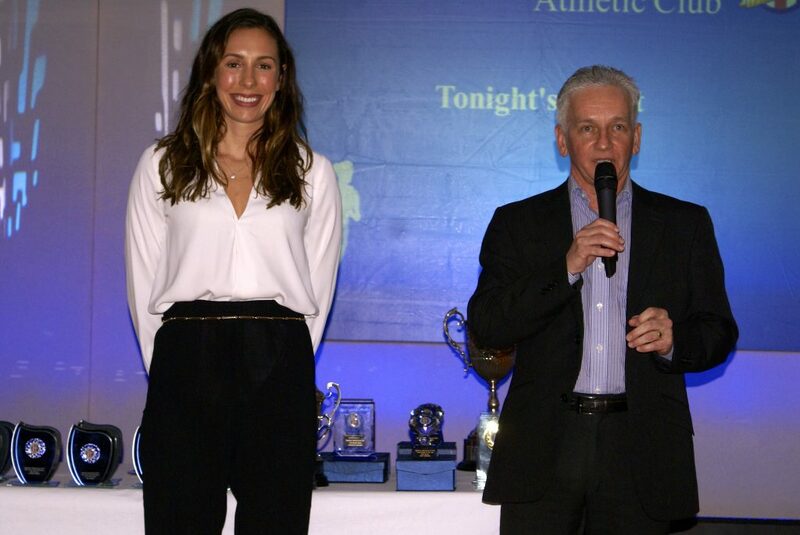 Club Chairman Tony Wood started the evening with a special mention of the first of our two Guest Presenters – Samantha Murray. 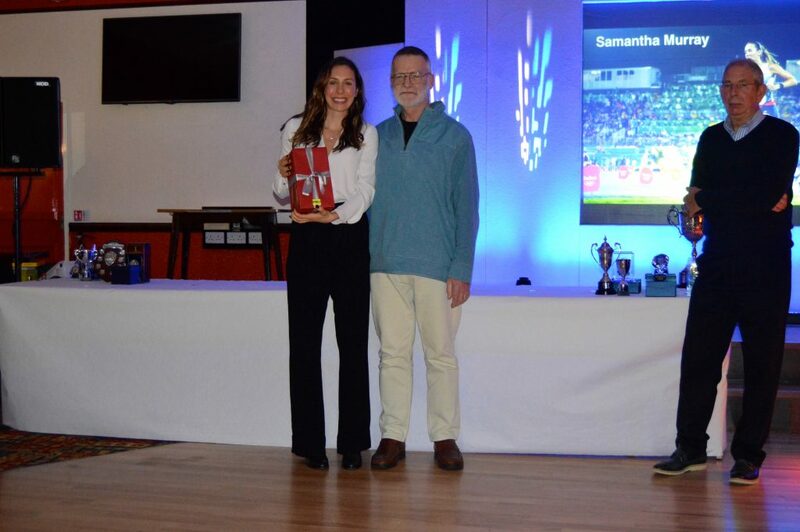 Samantha who joined the Club as a 15yr old went on to achieve magnificent success in the Modern Pentathlon winning the Silver Medal in the 2012 Olympics and became World Individual Champion in 2014 – outstanding achievements along side so many others over the years including winning the British Championships in 2013, 2014 and 2017. 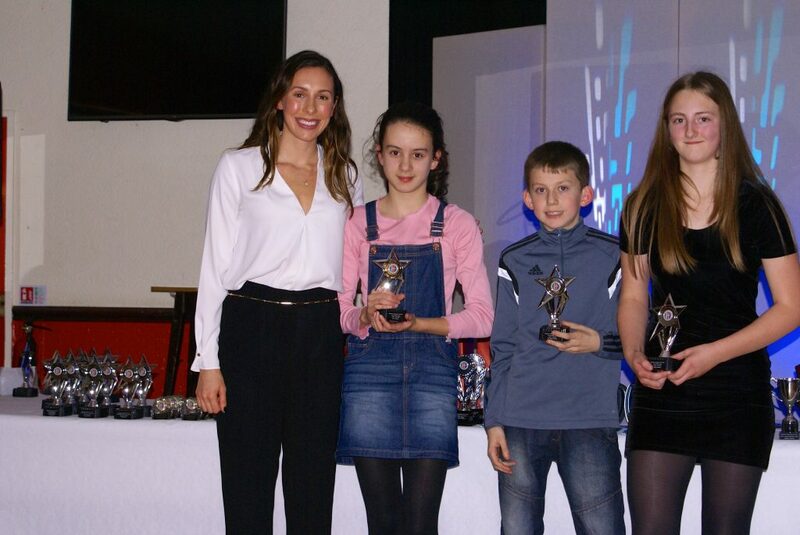 First Award of the evening – The Junior Squad Trophy – goes traditionally to the Sportshall Group which sees the Coaches nominate three Boys and three Girls. 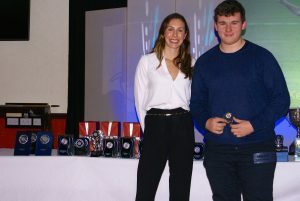 The Boys Nominations were Harrison Allcock, Thomas Flynn, Matthew Smith and the Girls Niamh Gate, Kady Thompson, Molly Grimshaw with Harrison and Niamh taking the Award. 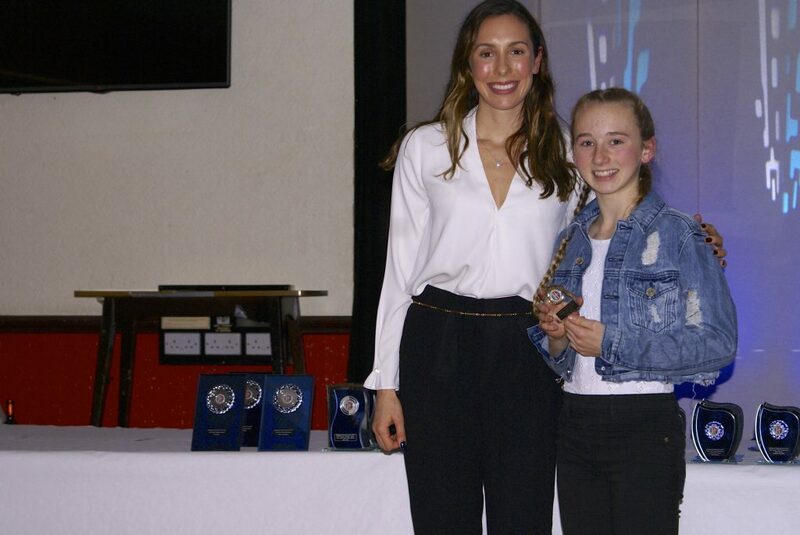 The U11 Endurance Award is given to recognise the efforts of the junior endurance athletes particularly during the 2016-17 cross country season. 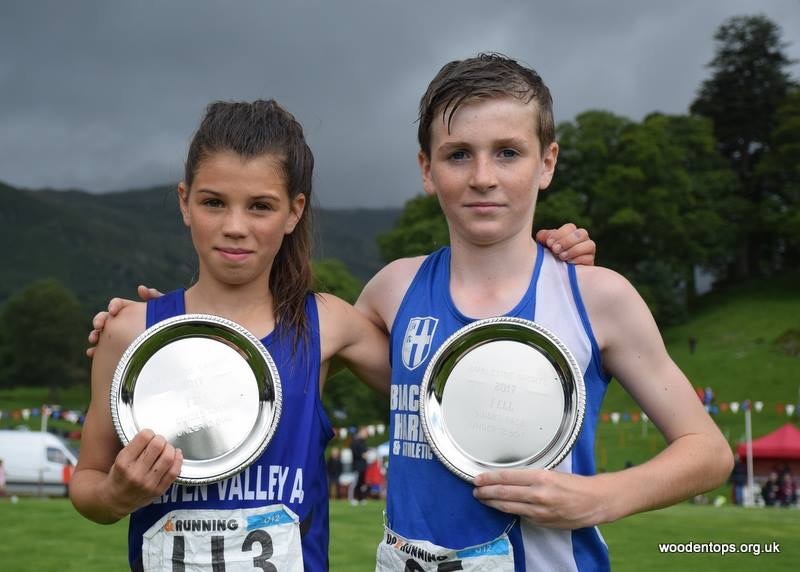 For the Boys the winner was Oliver Gill and for the Girls Isabelle Hartley. 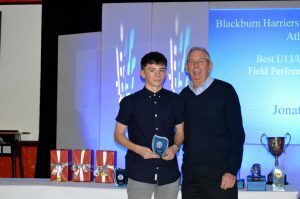 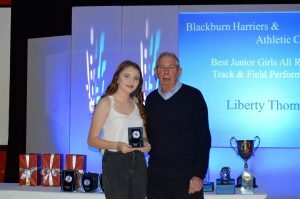 Junior Team Contribution to Track and Field Award goes to the junior athlete that has competed in most Club fixtures through the 2016 Track and Field season in the UKYDL, Mid Lancs and Lancashire County Championships. 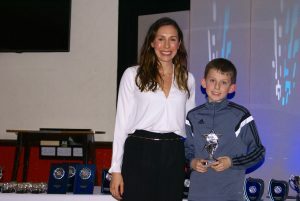 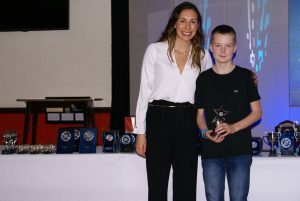 Kyle Taylor-Pomfret took the U13/U15 Boys Award followed by three winners of the U13/U15 Girls – Amy Davies, Eleesha Charnley and Leah Hoole. 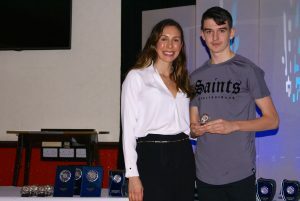 In the U17/U20 Male age category there were also three winners with Ben Whittaker, Jacob Roberts and Nicholas Smith and in the Female category Emily Warren and Chloe Bleeks were the winners. 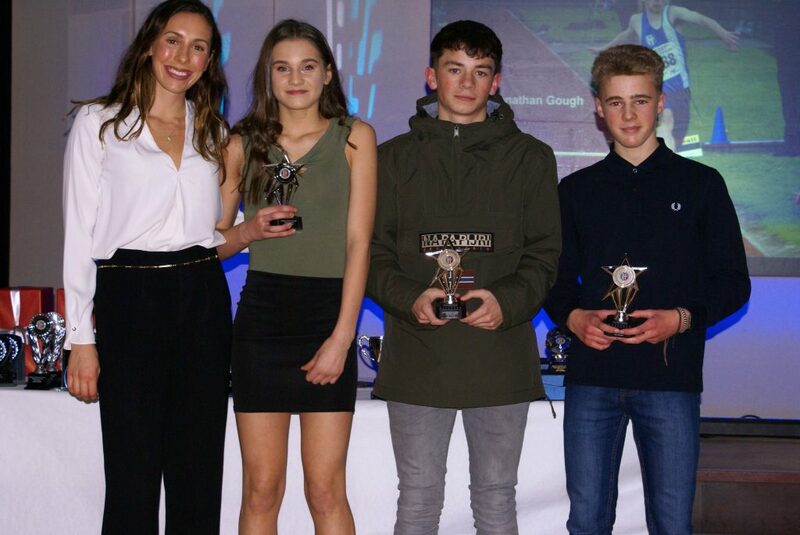 Junior Merit Award is presented to athletes new to the UKYDL who have impressed their respective team managers and coaches throughout the season with the winners in the U13’s being Kate Cookson, Nicky Saunders, Kyle Taylor-Pomfret and Rory Teare with Queen Tanimowo, Millie Coy, Sam Hodkinson and Jonathan Gough taking the Award in the U15’s. 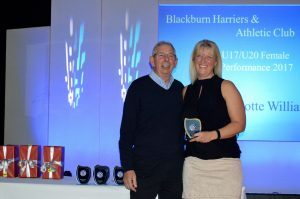 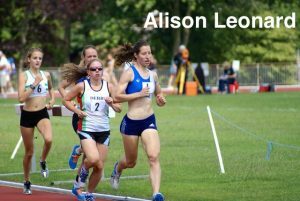 This award – Senior Team Contribution to Track and Field – goes to the athlete that has competed in most Club fixtures through the 2017 Track and Field season with a combination of Northern Senior League, Mid Lancs and Lancs Champs used to decide the winners. 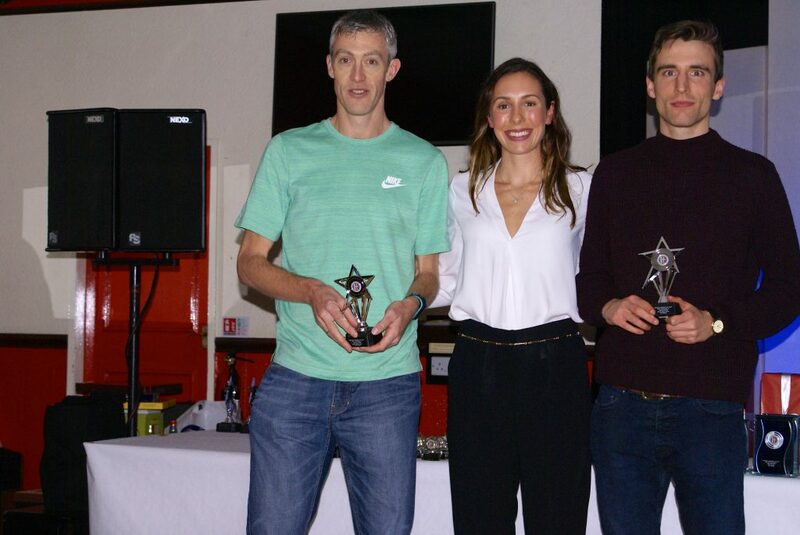 For the Men the winners were Chris Davies and Tim Raynes and for the Women Anna Peers. 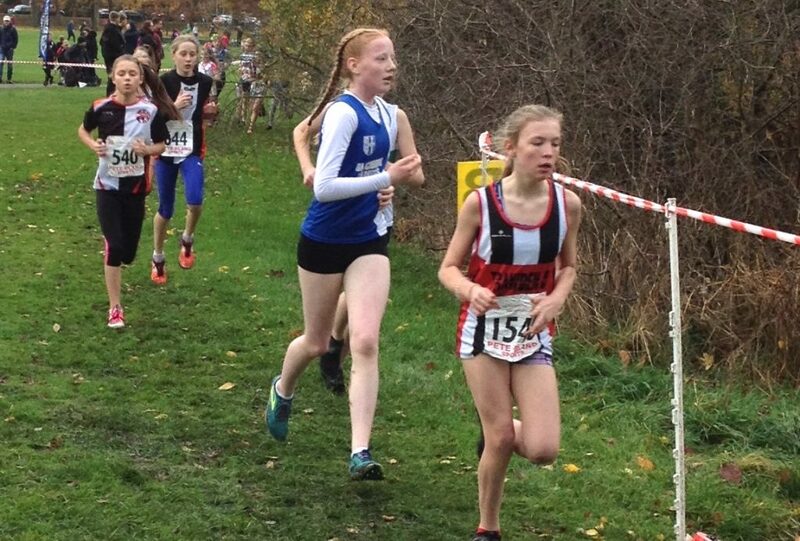 Junior Team Contribution to Cross Country Award goes to the Junior athlete that has competed in most club XC fixtures through the season. 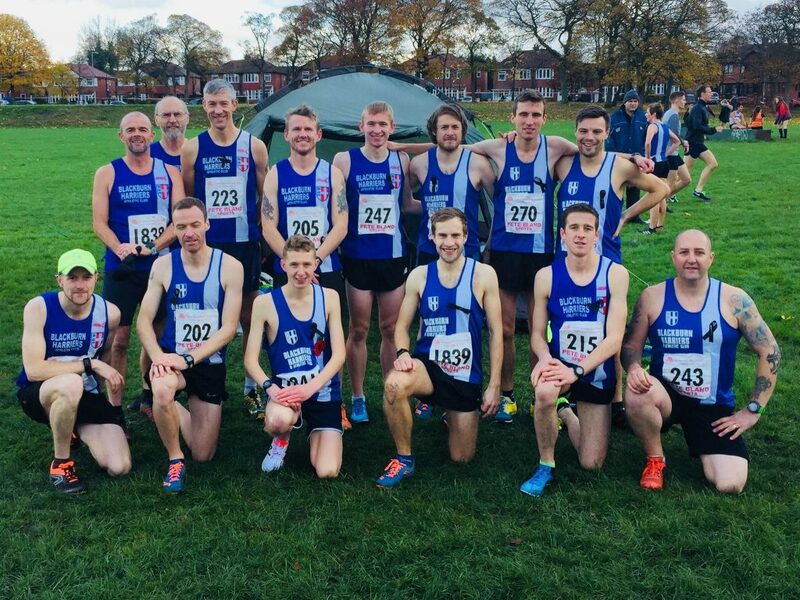 Red Rose and Mid Lancs Leagues, Lancs, Northern and National Champs. 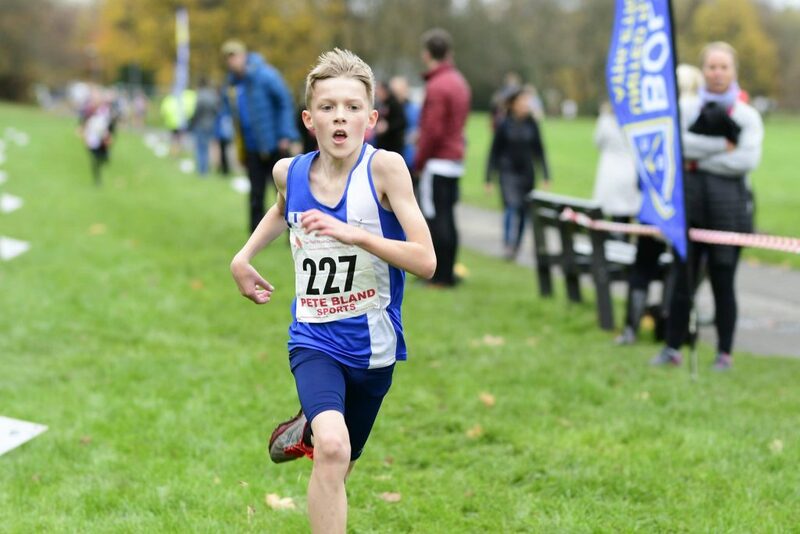 Boys Winners Ethan Barbarewicz (Total of 10 MLL XC and Red Rose XC as well as County and Northern) Girls Winner Amy Davies (4 out of 5 MLL XC and all 4 Red Rose XC plus the Lancs XC, Northern and National). 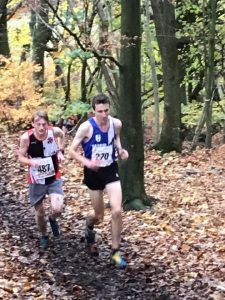 For the Seniors the Award went to Chris Davies (4 out of 5 MLL XC and all 4 Red Rose XC plus the Lancs XC, Northern and National and for the Women, Lindsay Davies took the Award (4 out of 5 MLL XC and 3 Red Rose XC plus the Lancs XC, Northern and National). 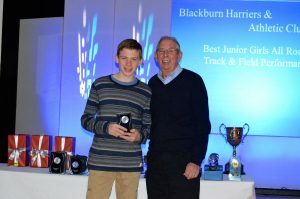 The next two Awards presented on the night covered the U13/U15 and U17/U20 Age Groups, the first of which was for the – Most Promising Young Athlete – an Award that highlights athletes that are usually new to the Harriers or just starting with the juniors and have started to make good progress through training and competing regularly and particularly look to have great prospects ahead for them. 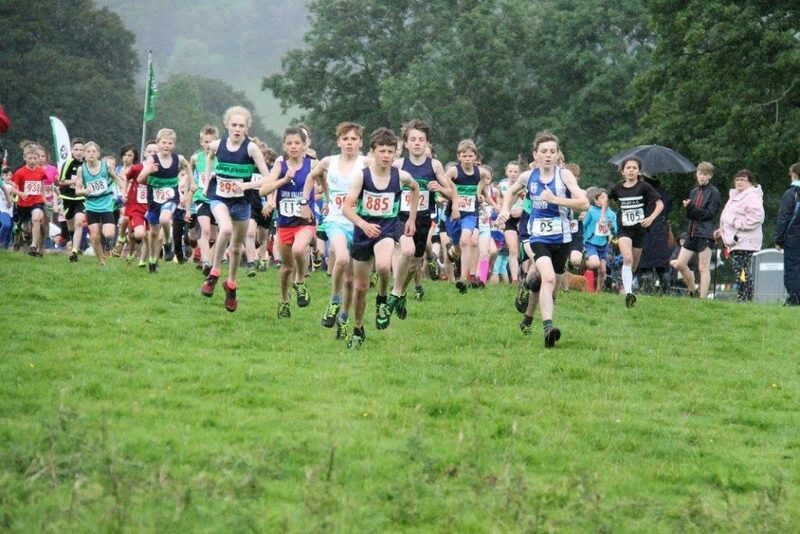 For the U13/U15 Age Category the Boys Winner was Dexta Thompson and for the Girls Hollie Cubbon. 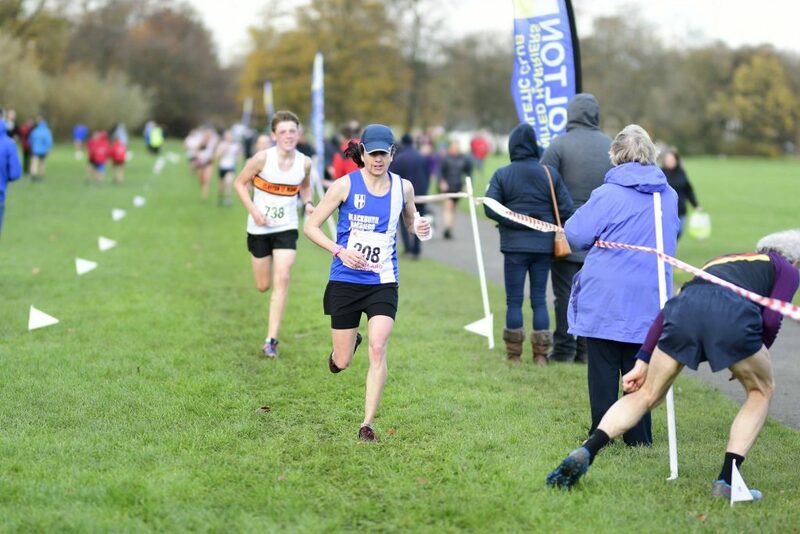 In the U17/U20’s the Winners were Bradley Meikleham and Emily Taberner. 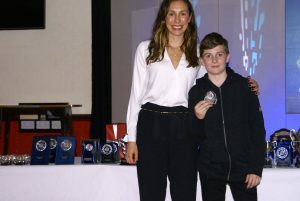 The second of these Awards – the Most Improved Young Athlete – went to Matt Ramsden for the U13/U15 Boys, to Myah Booth for the U13/U15 Girls, Ben Whittaker and Chloe Bleeks for the for the U17/U20’s. 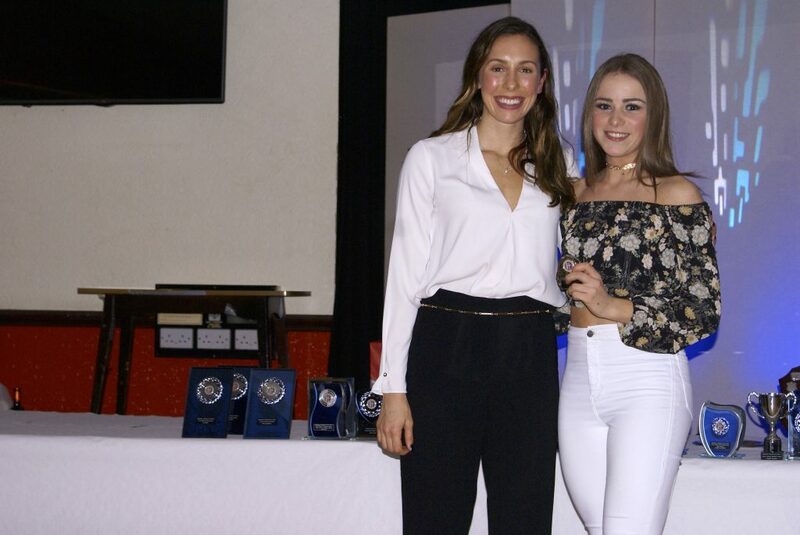 The next Award presented on the night – Outstanding Junior Commitment – went to athletes that have shown commitment and application beyond what would normally be expected in order to improve themselves or support their team mates. 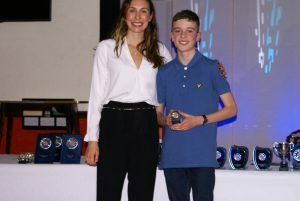 Cameron Harris won the Award for the U13/U15 Boys for achieving a National Standard 45.54m in the Javelin at English Schools and ending the season on top of the North West Rankings and 19th Nationally. 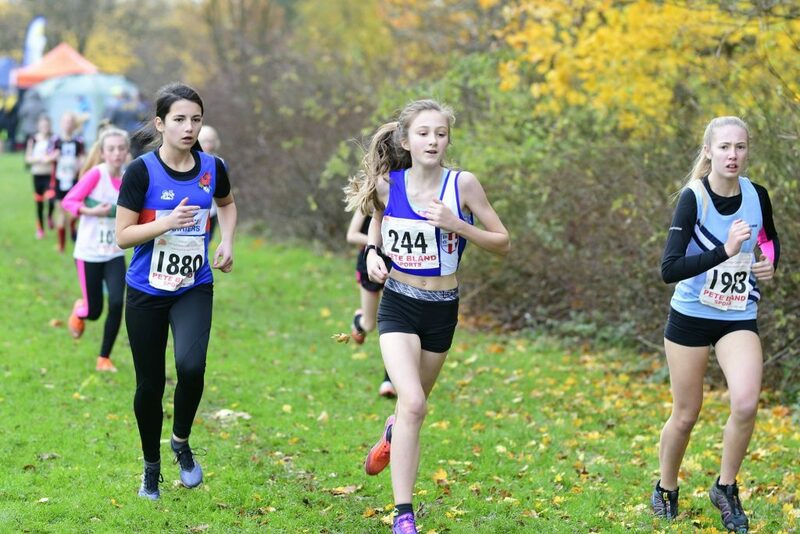 Eleesha Charnley took the U13/U15 Girls Award for her contribution in T&F, XC and Fell as well as being a key member of the road relay squad. 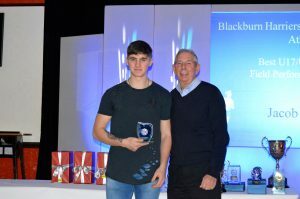 Anthony Kent won the U17/U20 category after finishing the season ranked number one in the North West, 12th in the country and reaching the English Schools Final – Coach Jim Kerrigan receiving his Award. 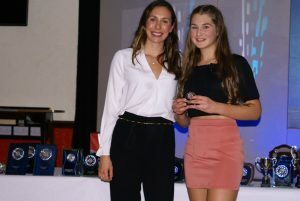 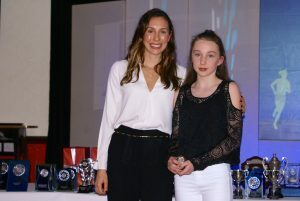 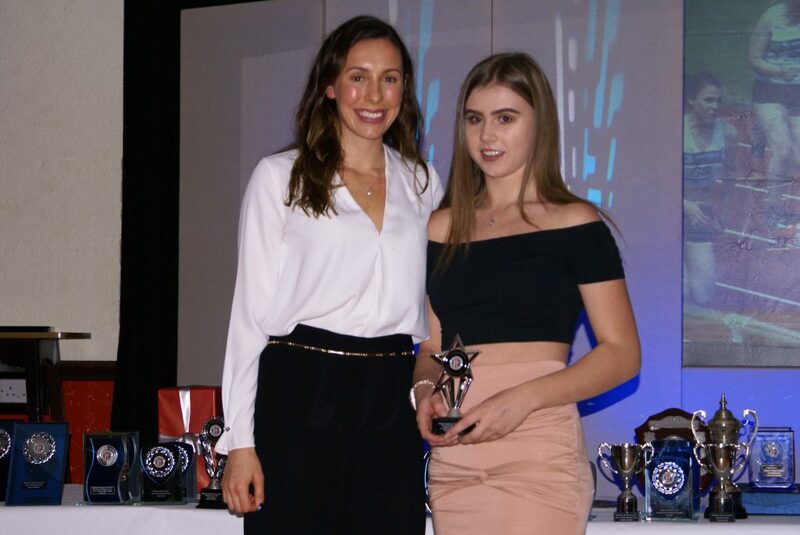 Maddie Elliott took the Female U17/U20 Award for competing more XC than any other in this age group, at T&F, and a key member of the relay squad. 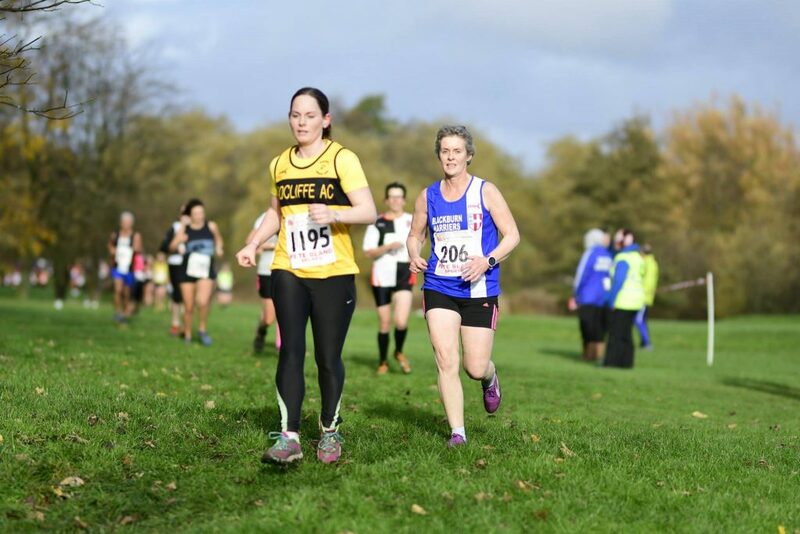 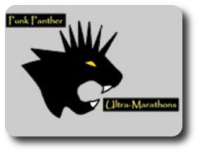 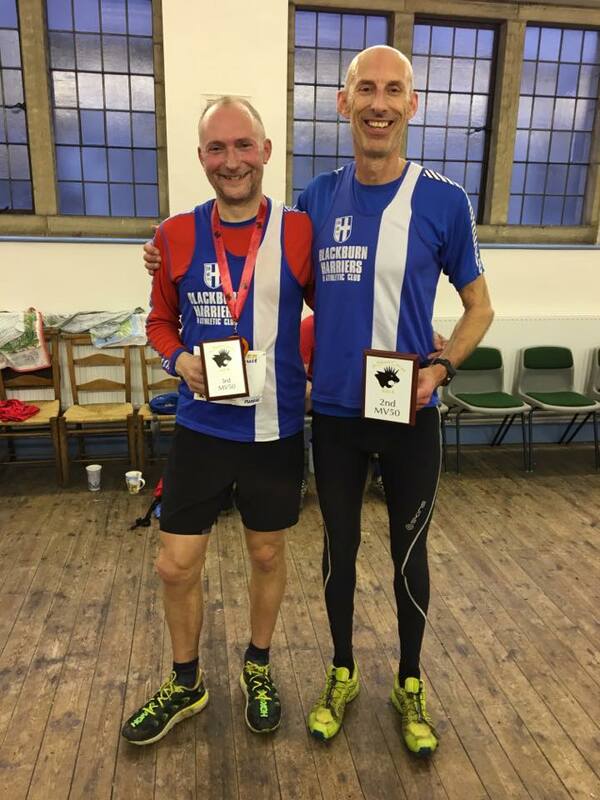 The Club’s next award – Club Road Running Award – is made to an athlete who has represented the club with great credit on the roads and conducts themselves in a manner that is a great example to the other members around them. 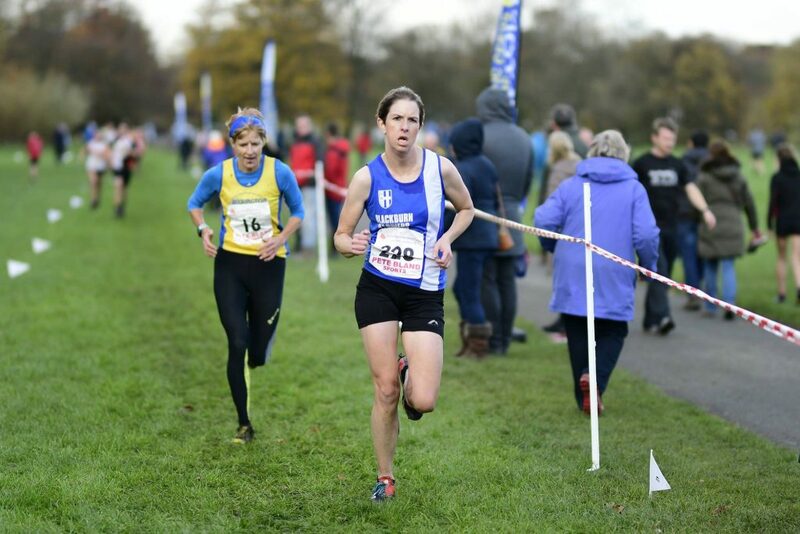 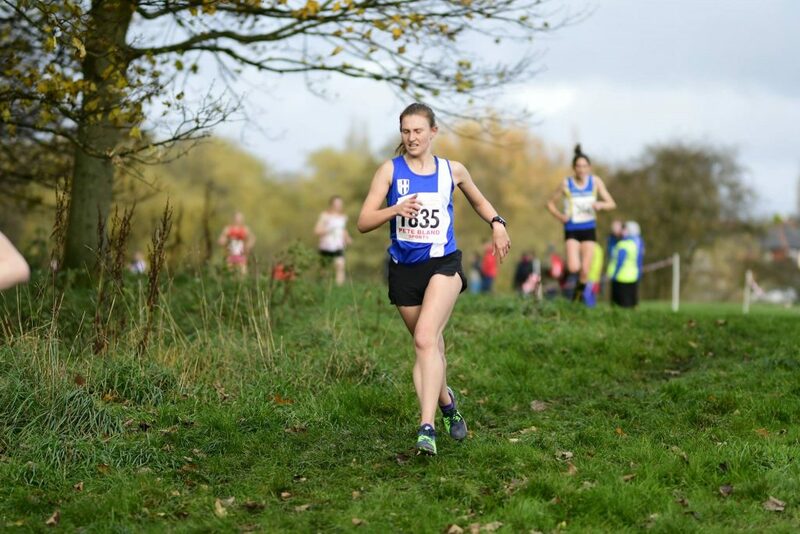 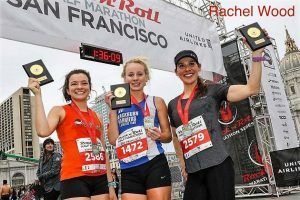 The Women’s Winner was Rachel Wood who won the San-Francisco Marathon and South Cheshire 20 and for the Men the Award went to Joe Monk for a season which saw him set new personal bests at 10k, 10mile and Half-Marathon. 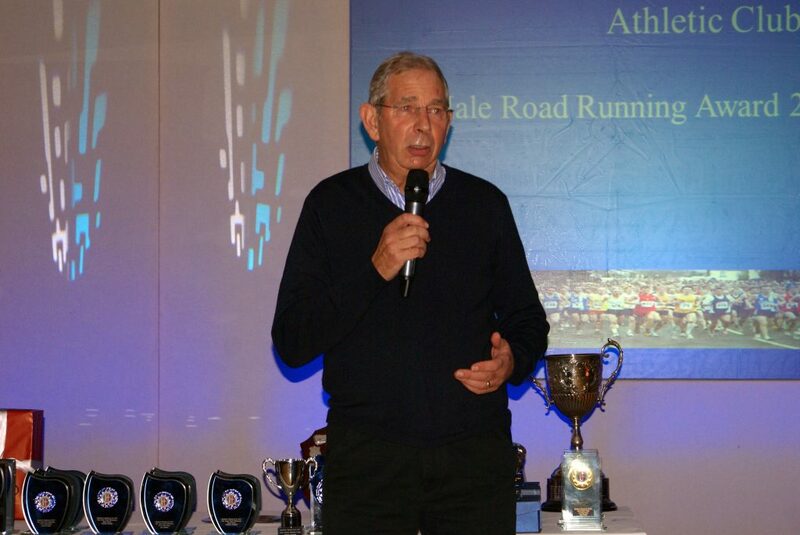 At this point in the evening it was time for the introduction of our next Guest Presenter – George Woodburn. 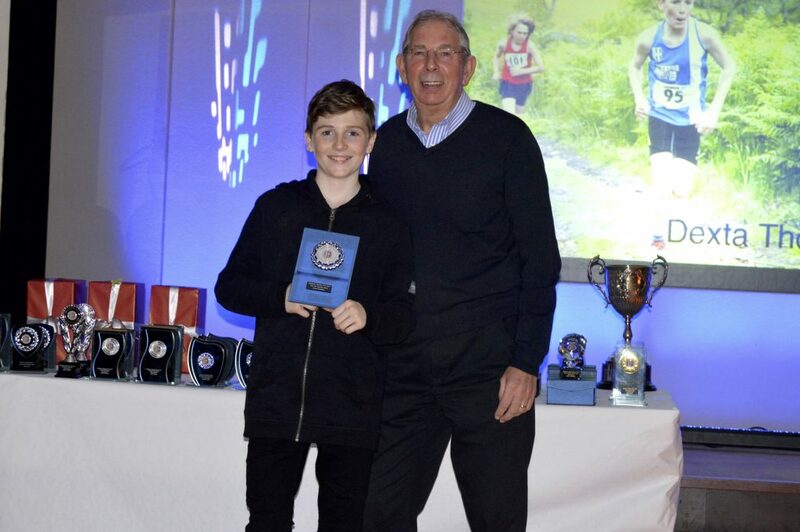 The Club Chairman introduced George as a long standing member of the Harriers, joining way back in 1964. 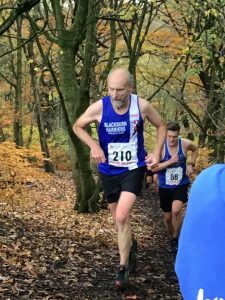 After a successful career as an endurance runner which saw him run 30mins for 10k, 67 mins for the half-marathon and 2.26 for the marathon and after 53 years membership George has continued to be extremely active in the Club as a Coach and Committee member. 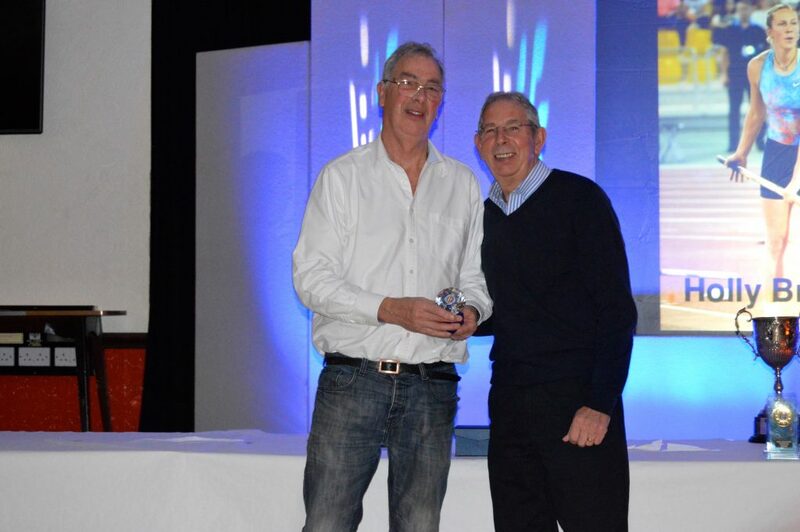 The Club Fell Running Award – is made to an athlete who has represented the club with great credit on the fells. 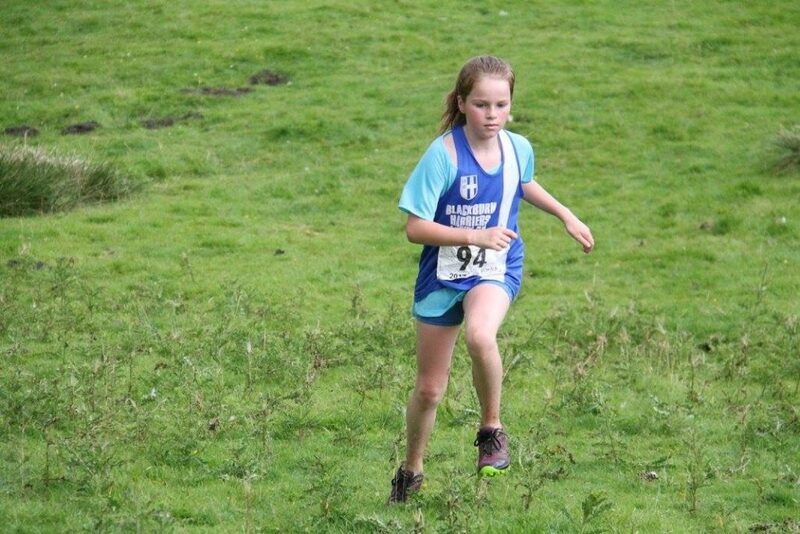 The deserved winner was Dexta Thompson who had a great season placing 3rd in the U13 FRA Champs – the English Junior Fell Champs 6 race series. 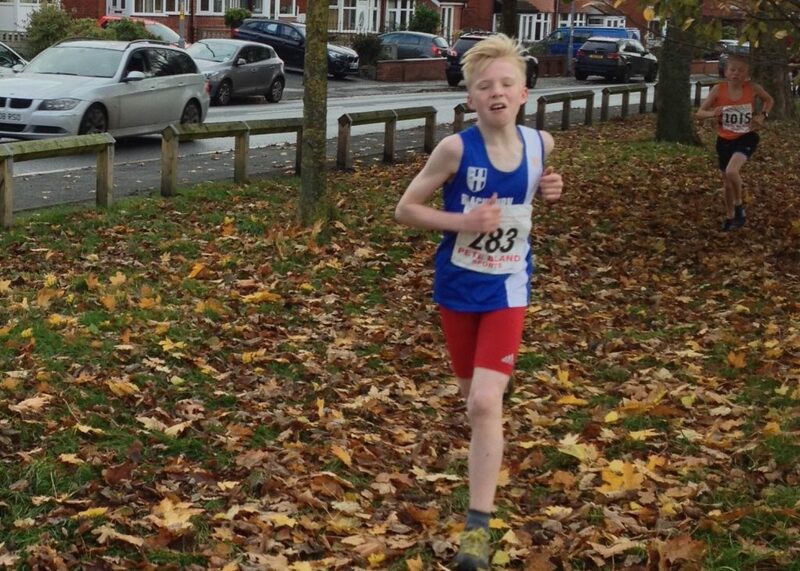 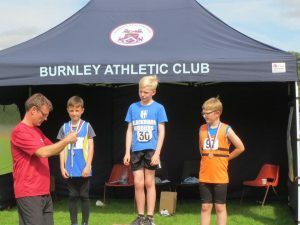 He backed that up with 2nd in the BOFRA U12s, taking the Lancashire U13 Fell title and also winning his age category in the Junior Burnley and Pendle Grand Prix Series. 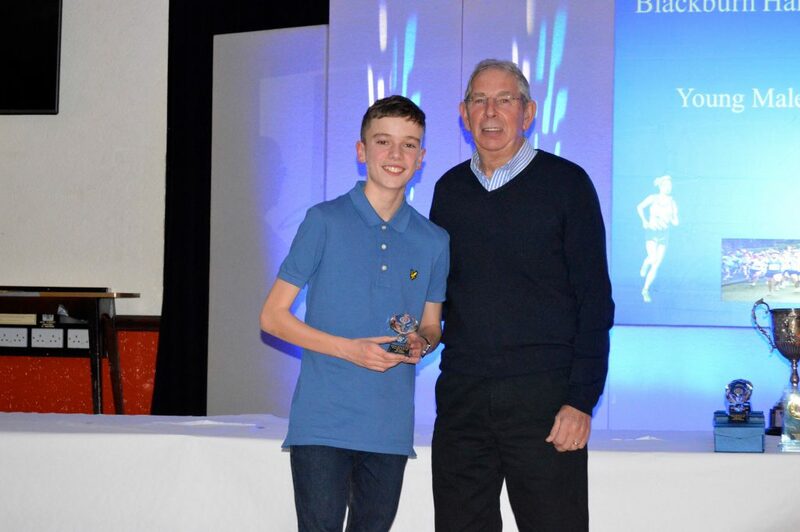 Going from juniors to veterans, the winners of the Best Veteran Athletes Award went to Ben Fish who during the course of the season competed on the Track at 800m, 1500m, 3000m, 5000m, 10000m and Steeplechase as well winning eight road 10k and half-marathon races. 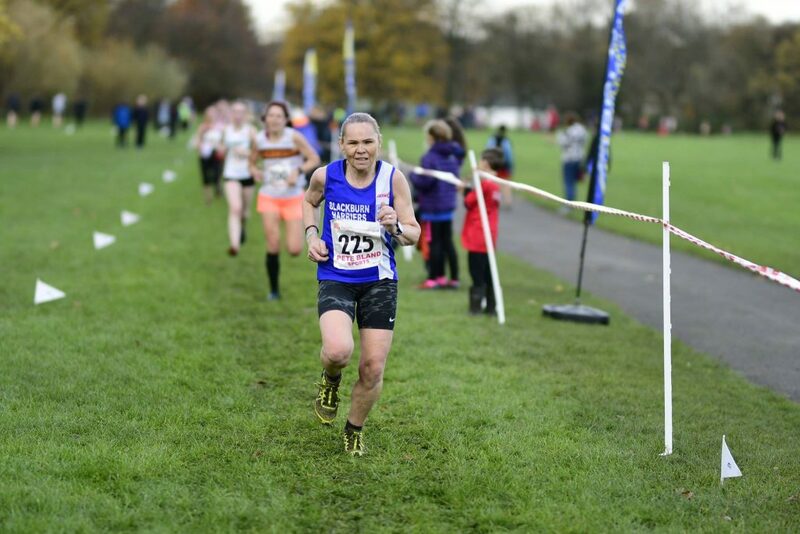 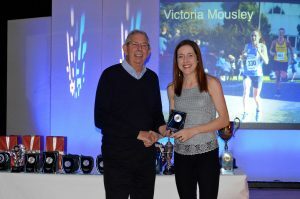 For the women, this Award went to Victoria Mousley after winning the 5k Veteran title at Horwich and recording six other wins at 10k and half-marathon. 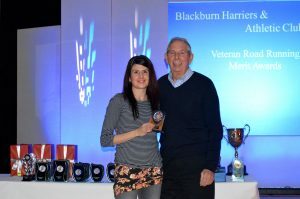 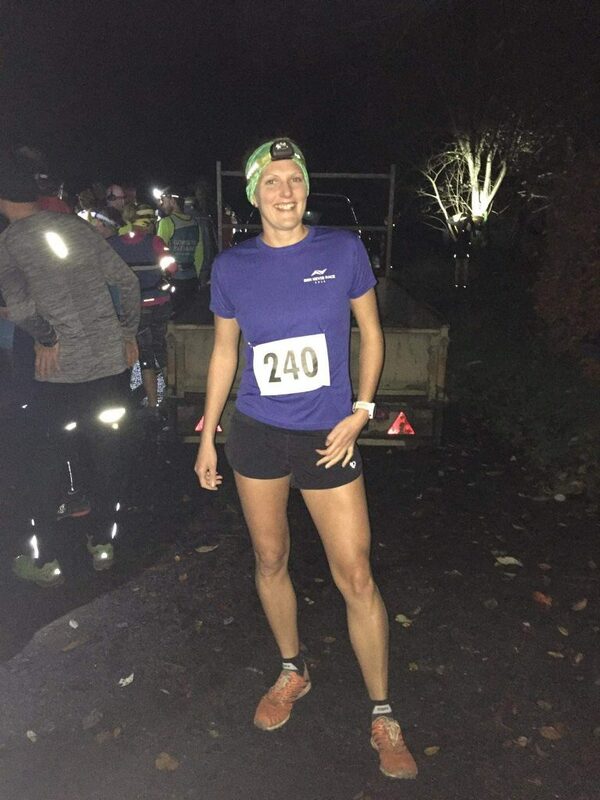 There was a second Veteran’s Award which was a Merit Award for Road Running and this was won by Carmen Byrne who recorded four wins at 10k and 10 mile. 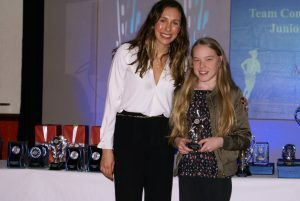 Normally there is just one Award for the Triathlete of the year but this year there were two. 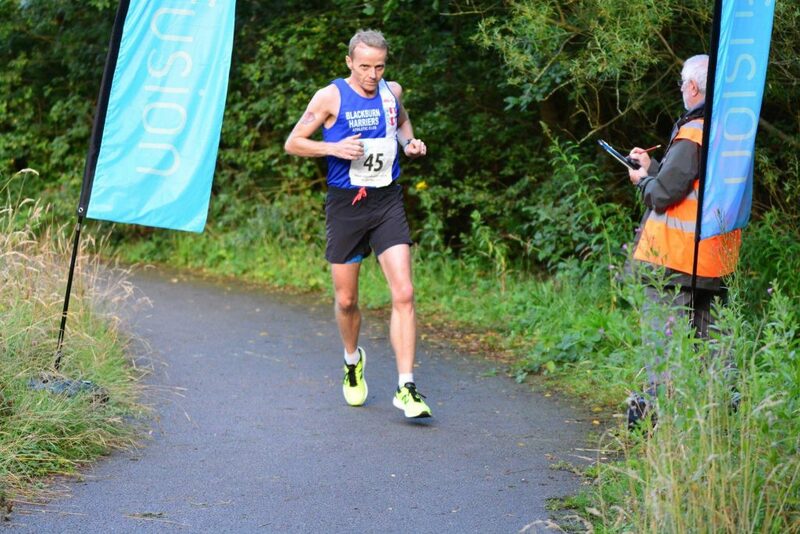 Our first Winner was Brian Fogarty after a tremendous performance in the British Ironman Championships where he placed 11th overall and first amateur. 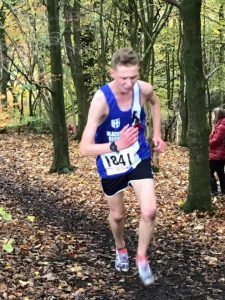 Our second Winner was Jack Hindle after a a stunning win at the Helvellyn Triathlon where he won the event by a full twelve minutes in front of the previously undefeated professional. 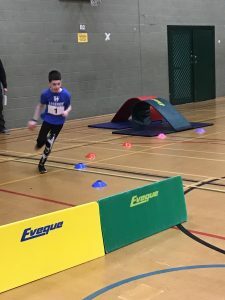 Many of our junior athletes participate in a variety of events, even if not true multi-eventers, This award – Best Junior All Round Track and Field Performance – reflects their versatility and the overall contribution they make to the Track and Field squad. 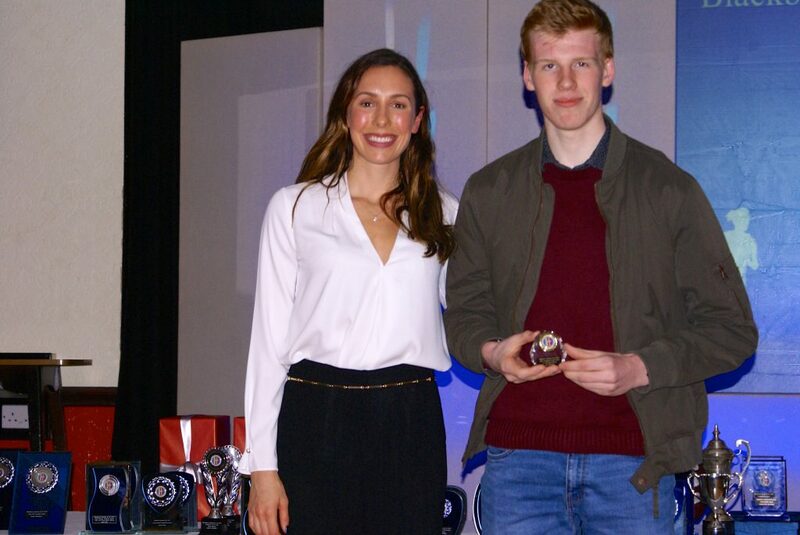 Our Boys Winner was George Whittaker who competed in ten different events during the season for the Club whilst the Girls Award went to Liberty Thompson who competed in nine events overall throughout the year. 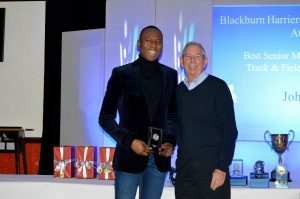 The Best Senior All Round Track and Field Performance went to John iLunga who competed in eleven events for the Club during the season as well as taking on a Decathlon at the Lancashire County Multi-Events Championships. 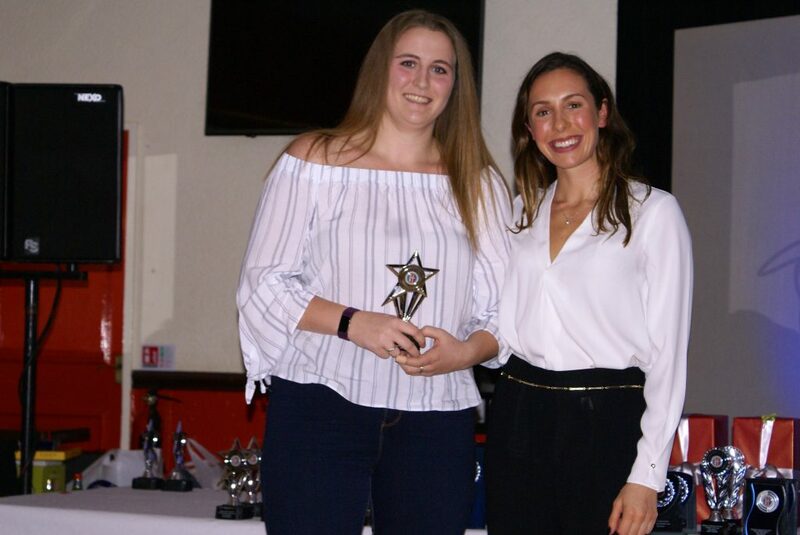 The Women’s Winner was Anna Peers who competed in all the Throws events for the Club in the Northern league amassing a massive one hundred and four points. 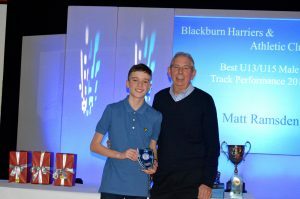 The Junior Awards for Best Performance (U13/U15) were won by Matt Ramsden for his 3000m time of 9.24.4 at Blackpool in August and Myah Booth for her 11.6 70m Hurdles time at the Blackburn Open. 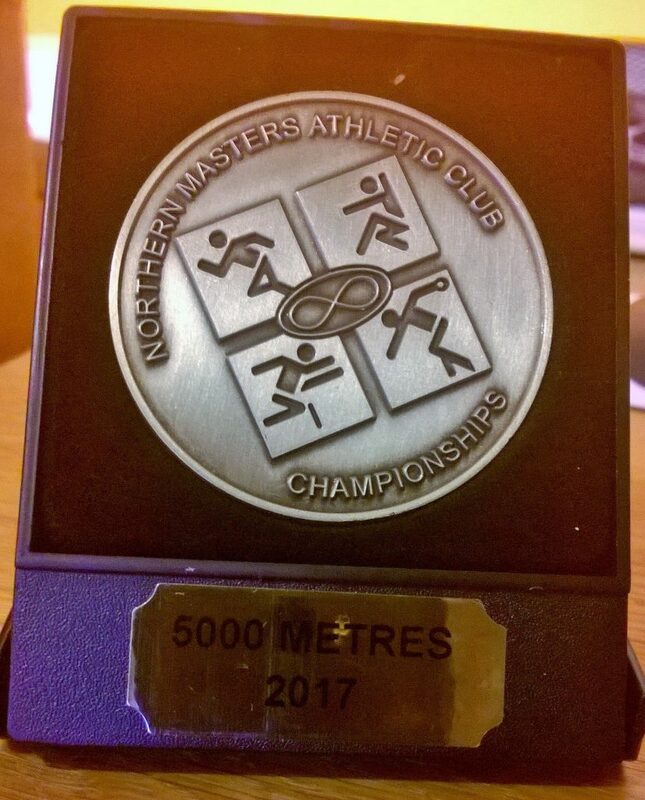 For the U17/U20’s age group Ross Liddle was the male Winner for his time of 50.6 in the 400m at a Northern League fixture in Liverpool and Emily Warren took the female Award for her 12.6 sec in the 80m Hurdles at the Blackburn Open. 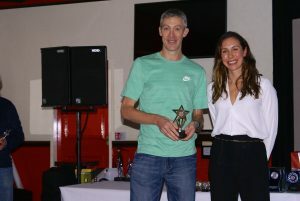 Rob Warner was the Winner of the Senior Award for his 3.49.1 1500m run at Trafford whilst Alison Leonard took the Women’s Award for 1500m run in Germany clocking a time of 4.24.4. 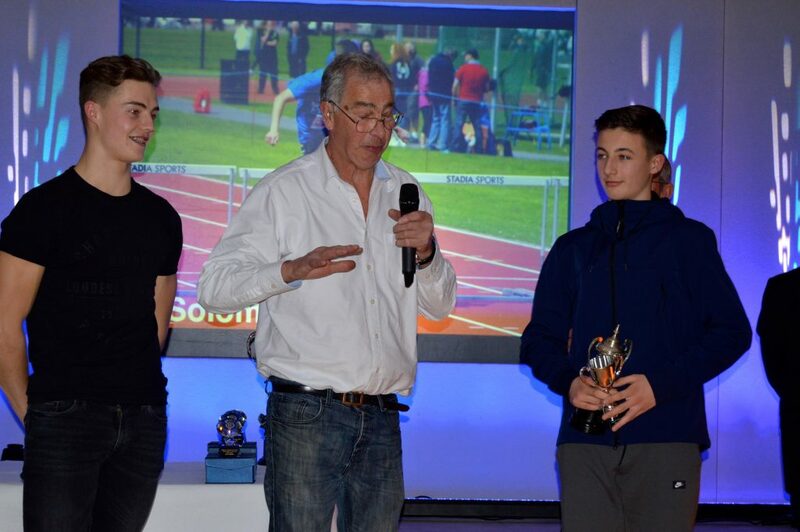 Rob’s Trafford time also saw him win the prestigeous Arthur Almond Trophy which is presented to the athlete with the best Track performance throughout the season. 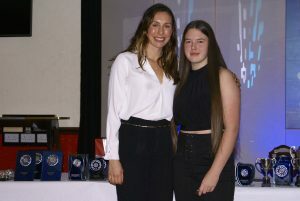 Our next Award of the evening – Best Schools Championship Performance of the Year – was presented to the athlete that has produced the best performance in a Schools Track and Field event during the season. 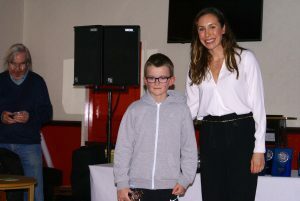 Winner of the Girls Award for her Silver Medal throw of 59.41m in the English School Hammer Final was Charlotte Williams (Brother George receiving her Award) whilst the Boys Award was won by Ross Liddle for his time of 54.3 in the 400m Hurdles Final. 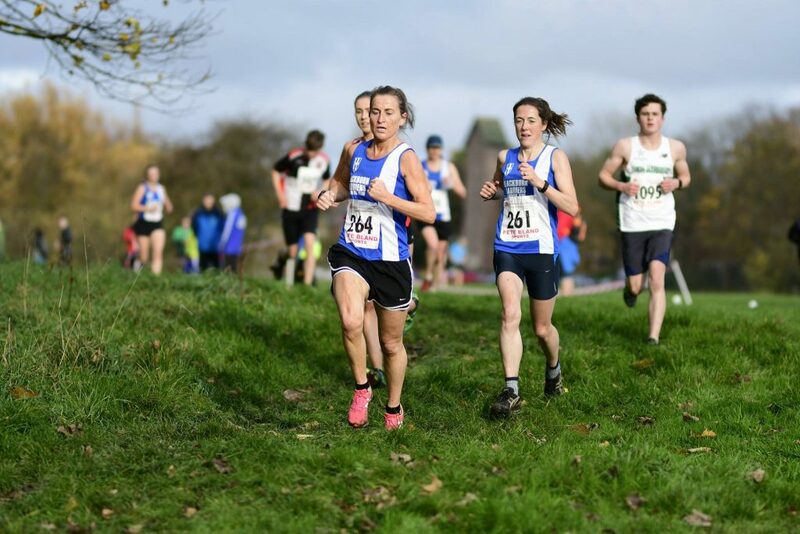 Four Awards for the Club Championship which is conducted throughout the year over varying types of Races on Road, Cross Country, Trail and Fell. 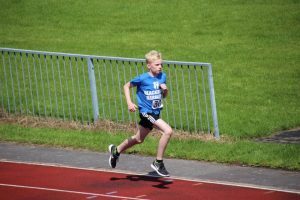 Fifteen Races in total with the best eight performances counting towards the eventual winners. 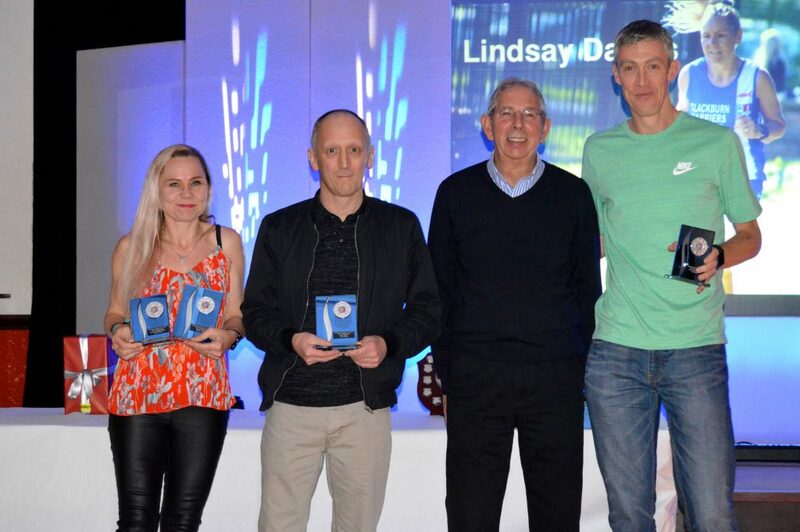 This year saw Lindsay Davies win both the Women’s Club Championship and Club Handicap whilst Chris Davies won the Men’s Club Championship and Ian Clarkson won the Club Handicap. 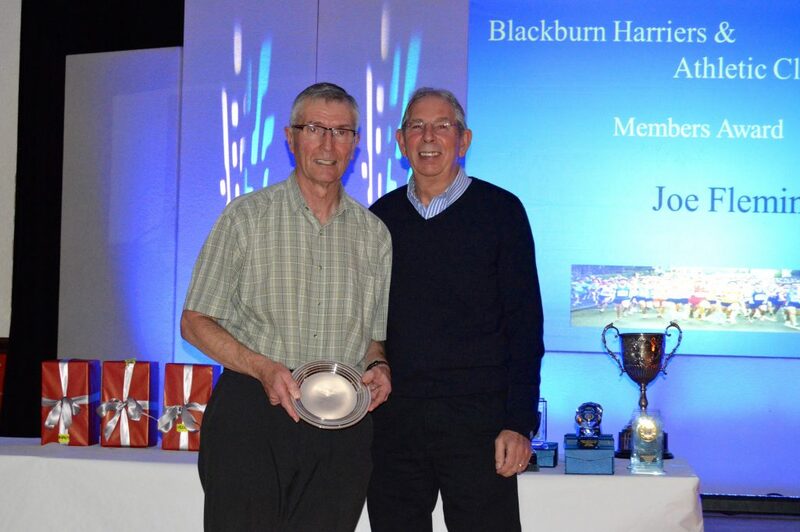 A very special Award made by the Harriers Club Committee was made to Joe Fleming, the Club’s High Jump Coach. 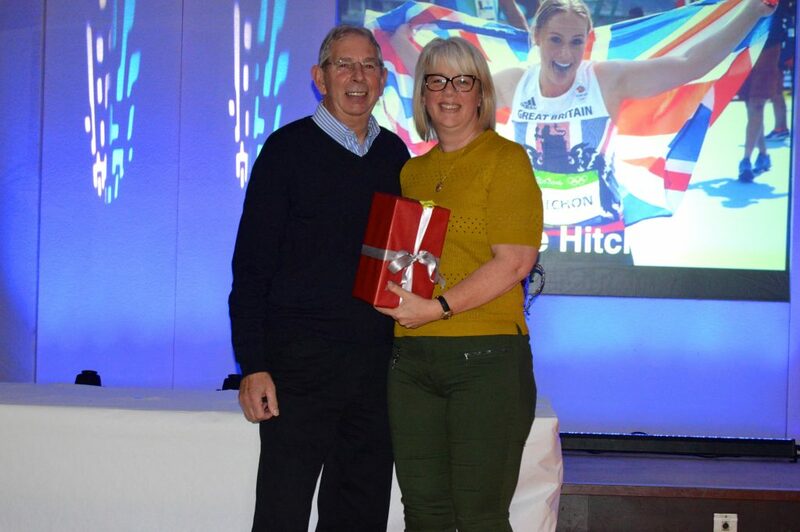 This Award is made in recognition of a contribution made by a member of the Club who has shown commitment and dedication in working for the betterment and improvement of the Clubs athletes and the Club itself. 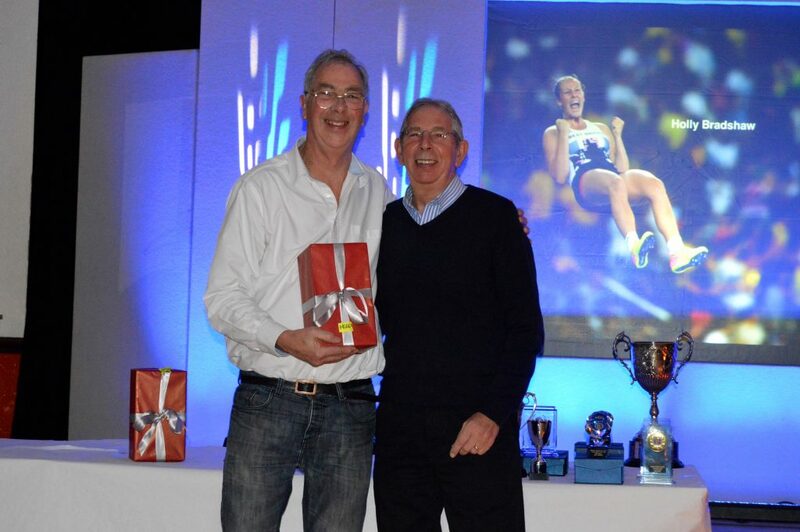 Over many years Joe has displayed all of these characteristics and was a very deserving winner. 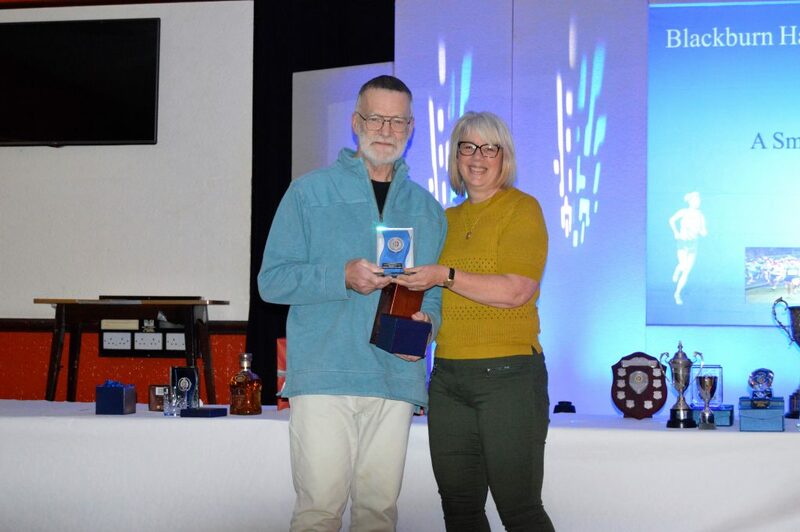 At the Club’s Annual General Meeting held recently it was announced that Richard Taylor was standing down as a Committee Member after a number of years in that role, as was the Club Secretary George Davies. 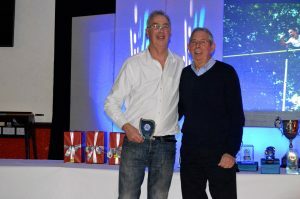 George continues on the Committee and was elected Vice-Chairman with Wendy Hitchon being elected the new Club Secretary. 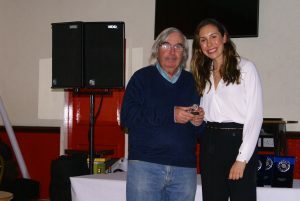 In recognition of the work they had done, the Club made awards to both Richard and George which were presented by Wendy. 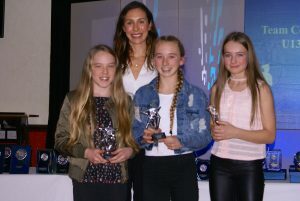 One of the highlights of the evening was the awarding of Life Memberships to Olympians Sophie Hitchon, Holly Bradshaw and Samantha Murray. 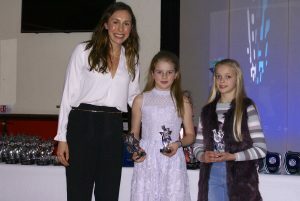 In introducing the Awards, Club Chairman Tony Wood told the assembled Harriers that granting Life membership was a an indication of the contribution that these three athletes had made not only in their own specific events but to the support and development of the Club as a whole and that it was fitting to mark those achievements and contributions in this way. 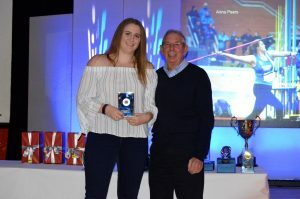 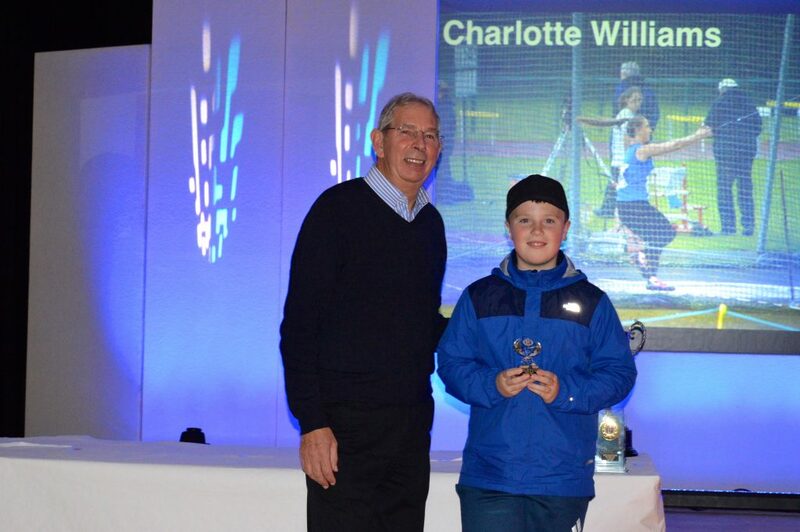 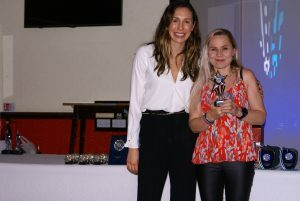 George Davies presented the Award to Samantha whilst Bob Groves received the Award for Holly Bradshaw as she was unfortunately unable to be there and Wendy Hitchon was presented with Sophie’s Award as she was in the US at a training camp. 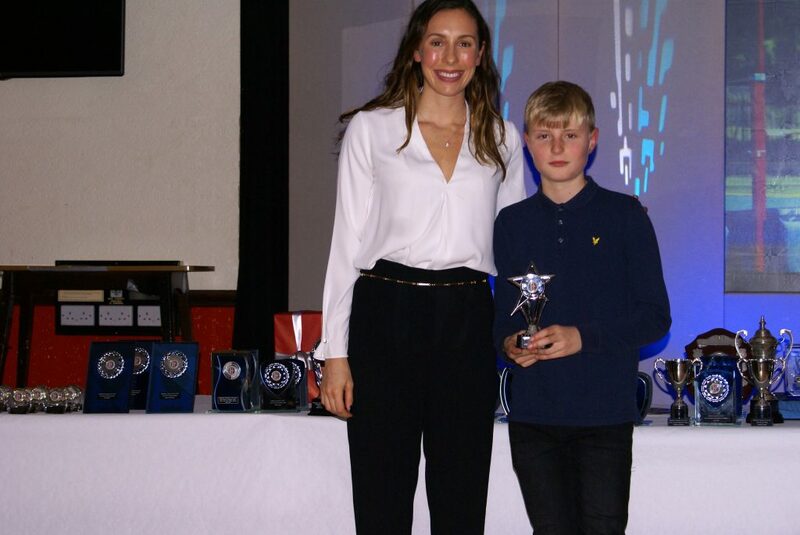 The Bob Groves Trophy which is presented by the Club’s Hurdles Squad was won by Solomon Brown recognising his step up to 400m Hurdles and his improvement throughout the season. 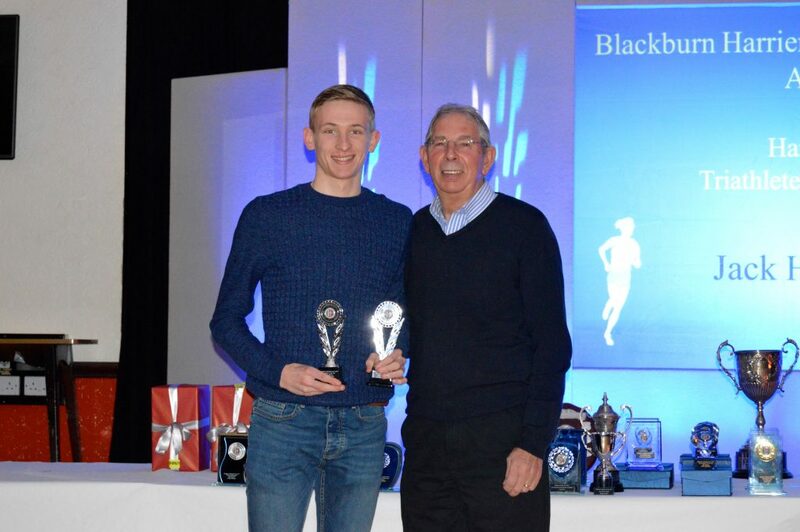 Bob took the opportunity to highlight the progress that Solomon had made throughout the year alongside Club record holder for 400m Hurdles – Ross Liddle. 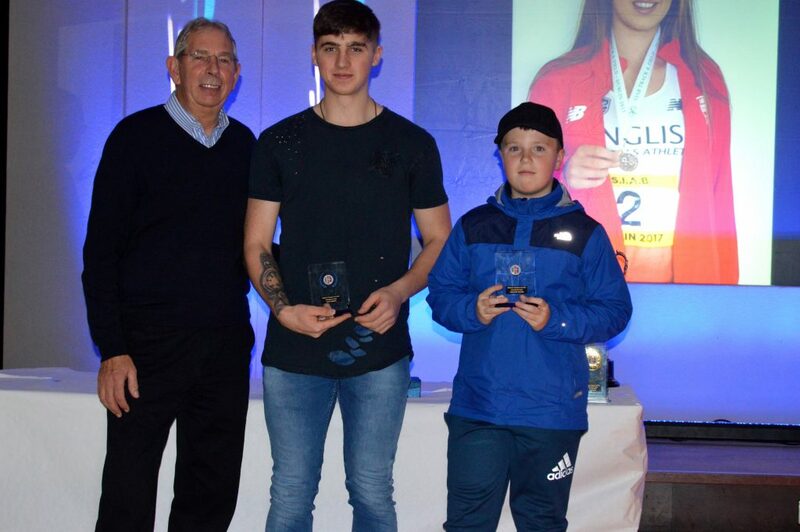 Charlotte Williams and Jacob Roberts, two of the Clubs very successful Hammer Throwers were presented with International Awards, an Award which recognises the increasing number of athletes that have represented the Club at International level during the year and in 2017 both athletes were selected to compete for England. 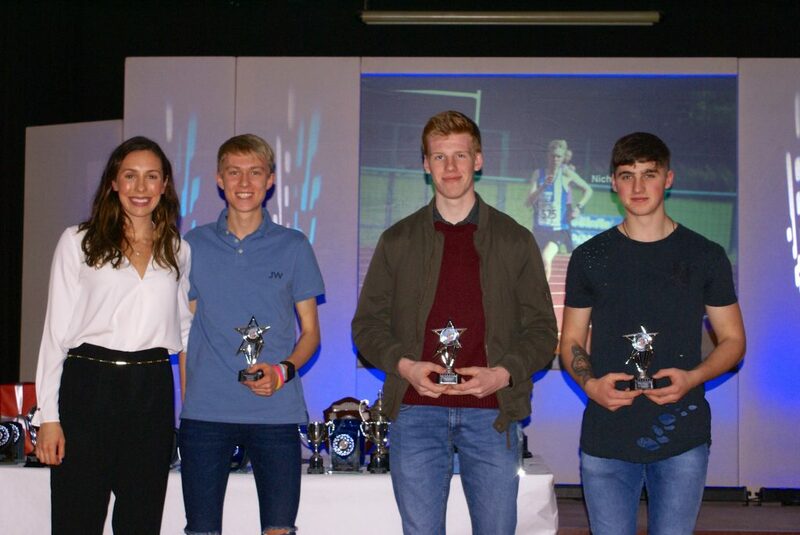 On to the Athlete of the Year for Juniors and Seniors which highlighted some great performances. 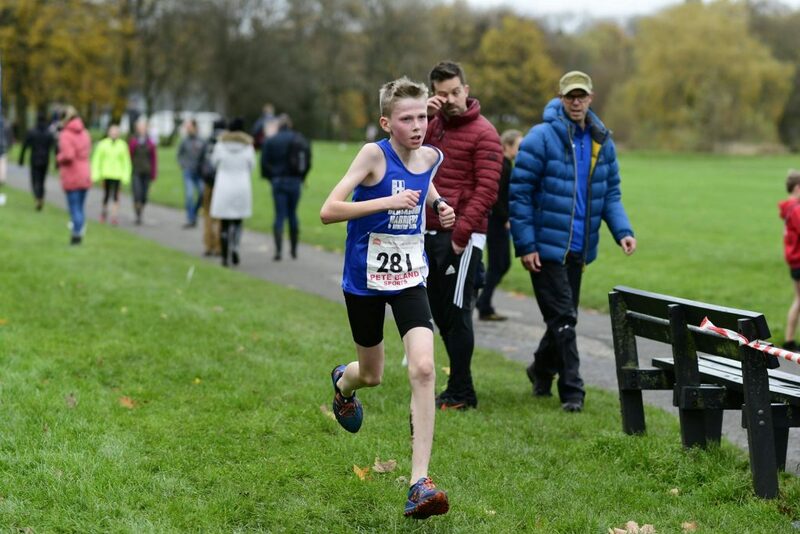 Junior Male Winner was U15 Matt Ramsden for his 3000m time of 9.24.4 which puts him at the top of the North West Rankings by over half a minute and in the top twenty in the Nationally. 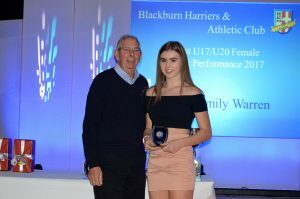 The Female Junior Winner was Charlotte Williams for her throw of 60.53m in the Hammer, finishing the season 2nd in the North West rankings and 2nd Nationally. 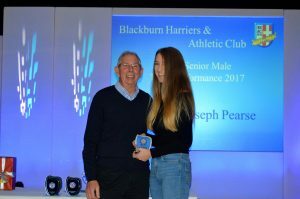 Senior Male Winner was Rob Warner for his personal best time of 3.49.12 whilst the Female Winner Holly Bradshaw won after breaking her own British Outdoor Pole Vault Record with a clearance of 4.81m. 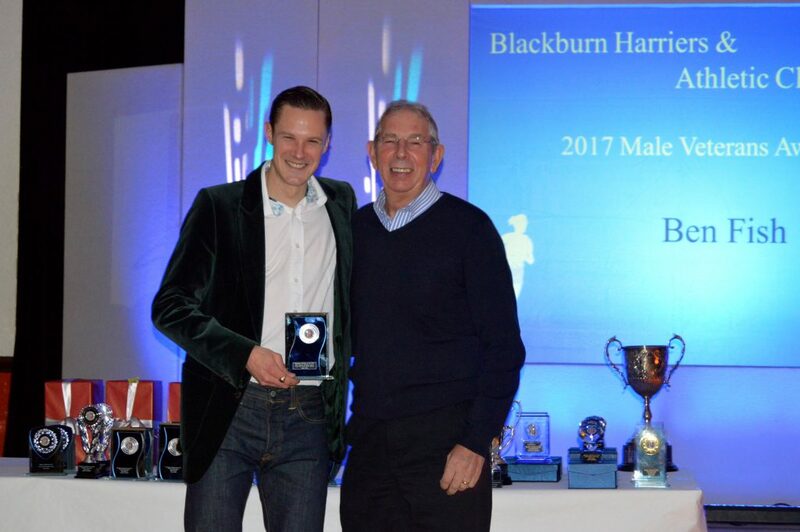 The Final Award of the evening is the Round Chase Trophy, a trophy that has been in the Club for well over eighty years. 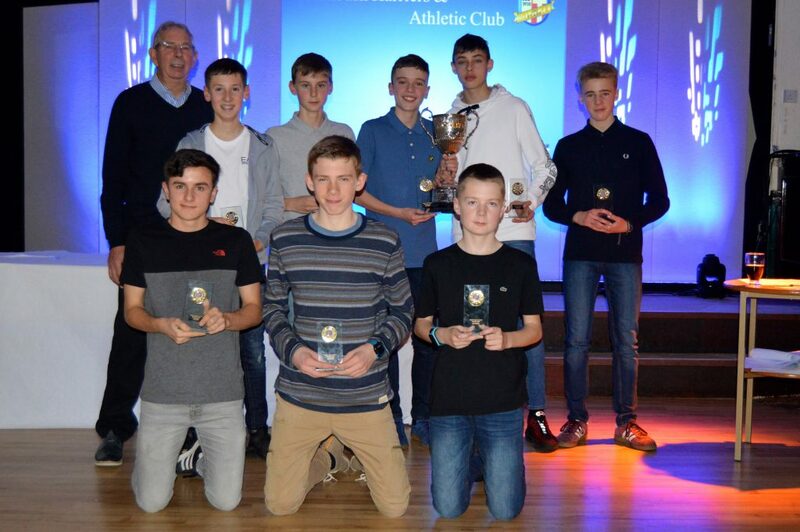 And it was fitting that George Woodburn who has contributed so much to Endurance running in the Club was able to present the Cup and the individual medals to the U15 Boys Endurance Squad who have had a fantastic year. 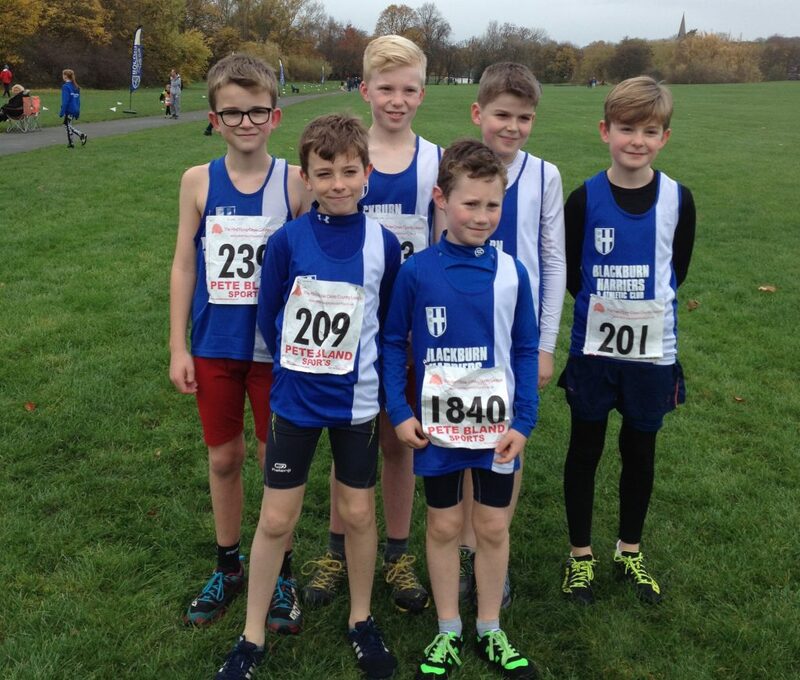 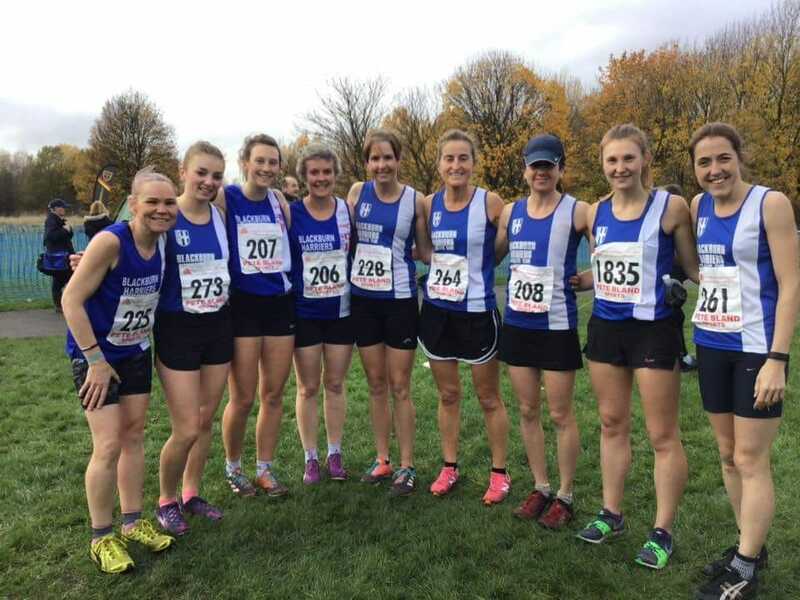 They came 2nd in the Red Rose Cross Country League – 1st in the Mid Lancs Cross Country League – won the U15 Lancashire Road Relays and North West Road Relays in Blackpool – followed that up by winning the Northern Road Relays at Sportscity and capped it off with a Silver Medal in the National Road Relays at Sutton Park. 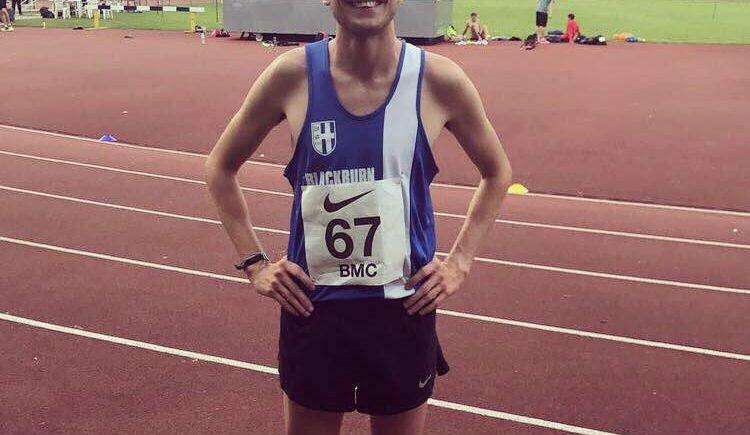 In just over two weeks Rob Warner has run two BMC Gold Standard and one BMC Grand Prix 1500m Races, getting faster at each one, earning him a hat-trick of successive PB’s. 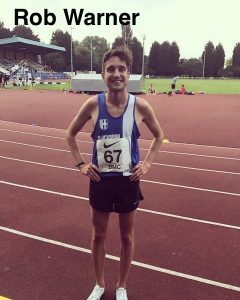 On July 8th Rob ran 3.51.34 for a then new personal best by two seconds – four days later he set another new PB running 3.51.25 and in his latest Race – BMC Gold Standard – at Stretford (July 25th) Rob broke through the 3.50 barrier coming home 8th in a time of 3.49.12. 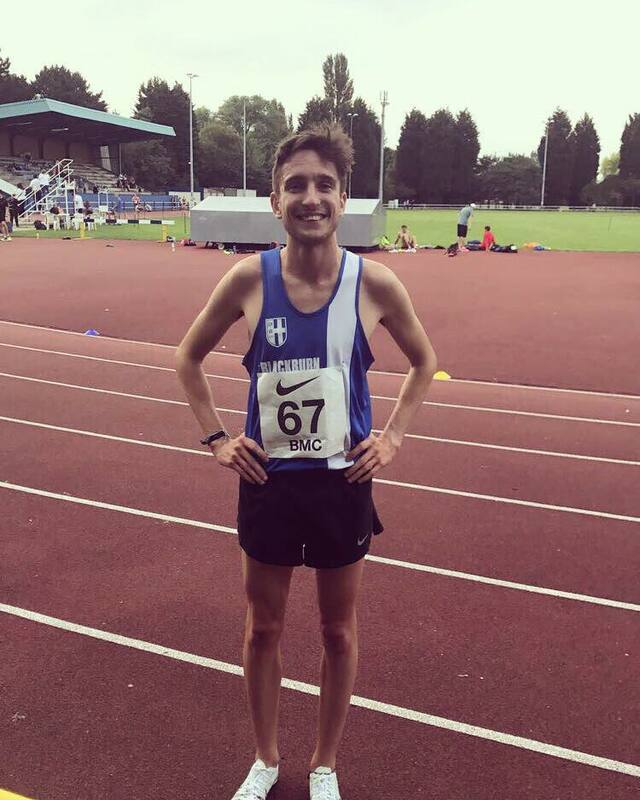 The current Club Record of 3.44.14 was set by Jason Lobo in July 1993 and who would bet against Rob seriously challenging that over the next couple of track seasons. 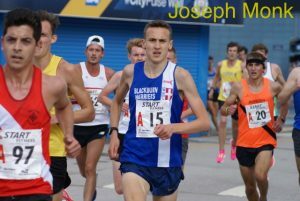 On the same night Joe Monk ran the Grand Prix 1500m coming home in 9th spot with a seasons best time of 4.10.35, just two tenths off his personal best of 4.12.13. 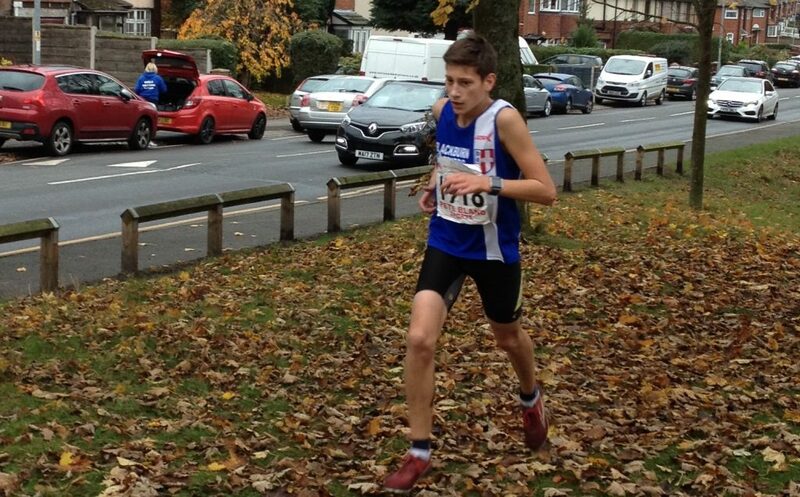 Ben Fish took on the 3000m featuring twenty three athletes, finishing in 7th place with a time of 8.37.75. 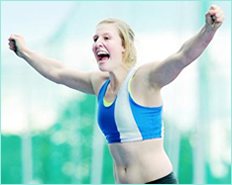 (Results – Not Yet Available). 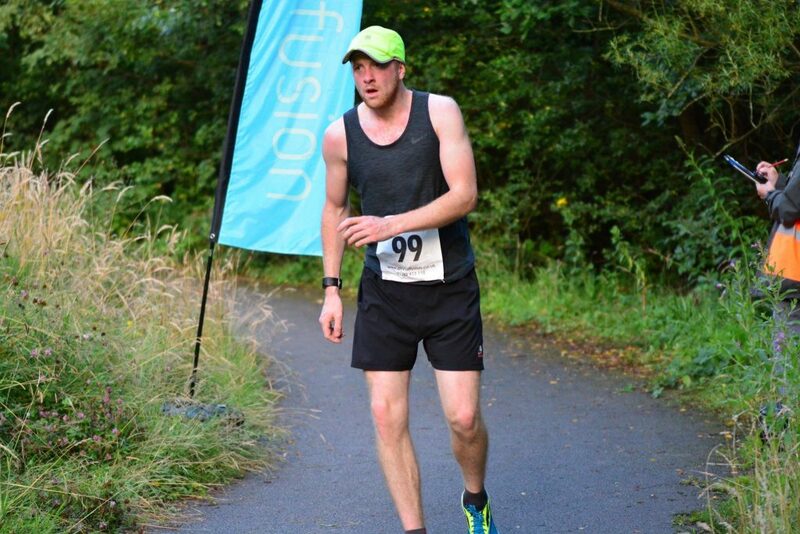 One hundred and eighty finishers in this local 5k Race won by James Hall in 15.44. 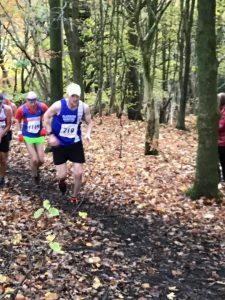 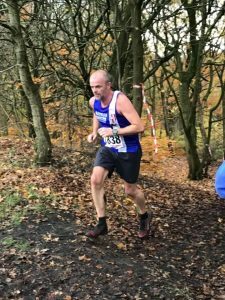 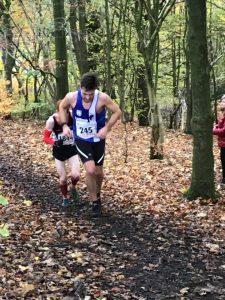 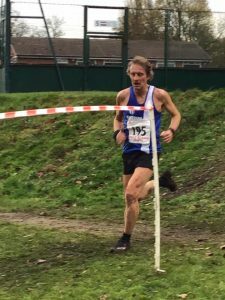 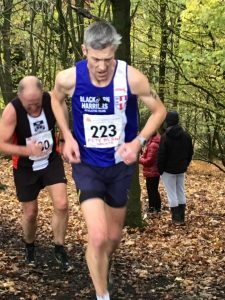 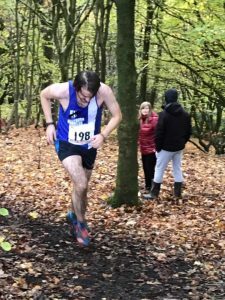 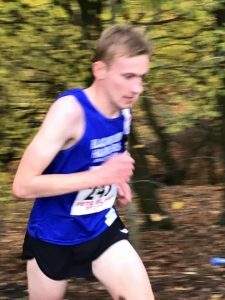 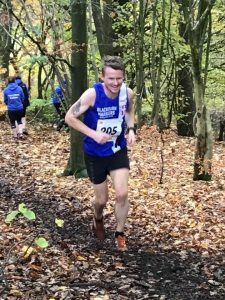 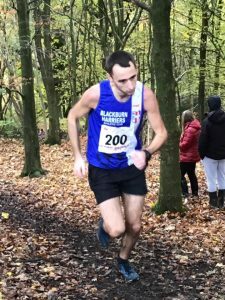 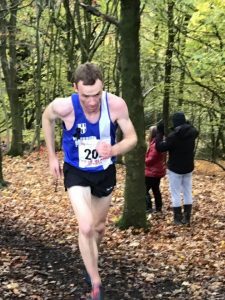 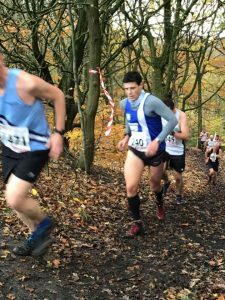 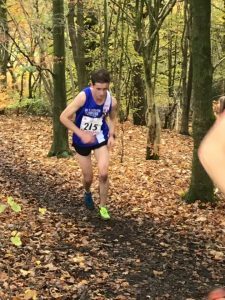 Blackburn Harriers had three athletes in the top ten finishers – Shaun Livesey being the first of them in 6th place overall and 2nd V40 (17.07), followed by Ben Costello in 7th just three seconds behind in 17.10 and Derek Reilly in 10th with a time of 17.29 which was good packing by the lads. 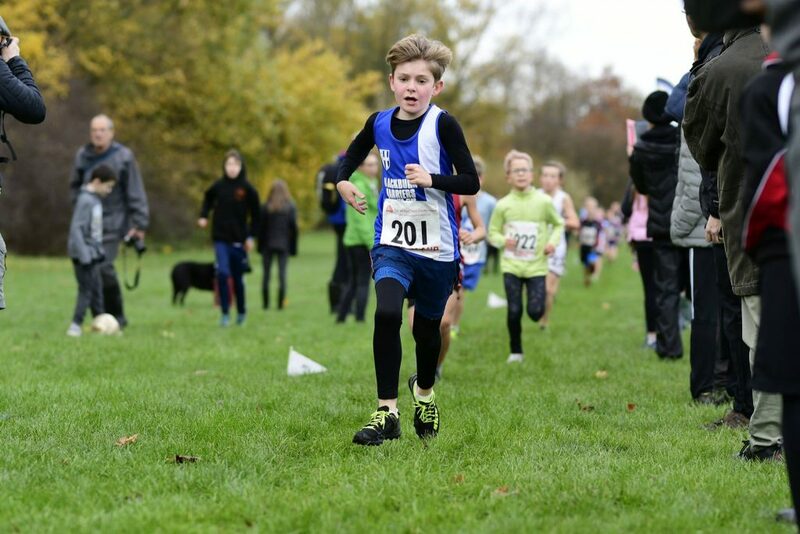 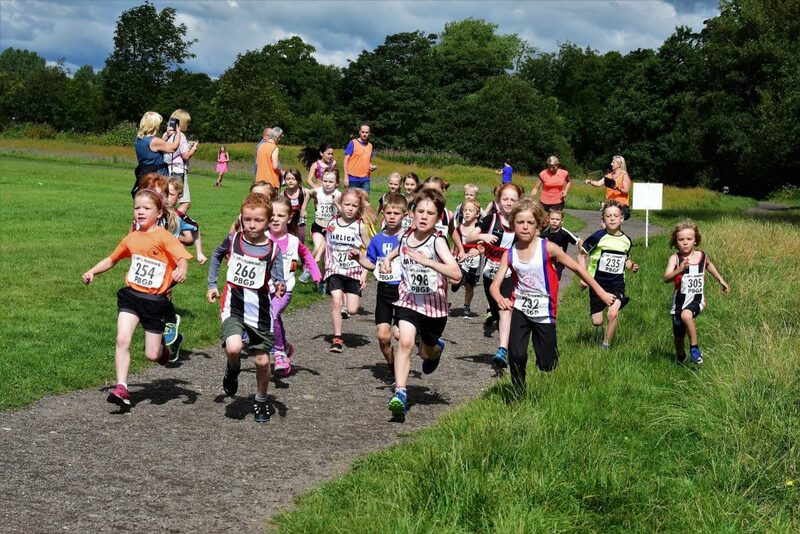 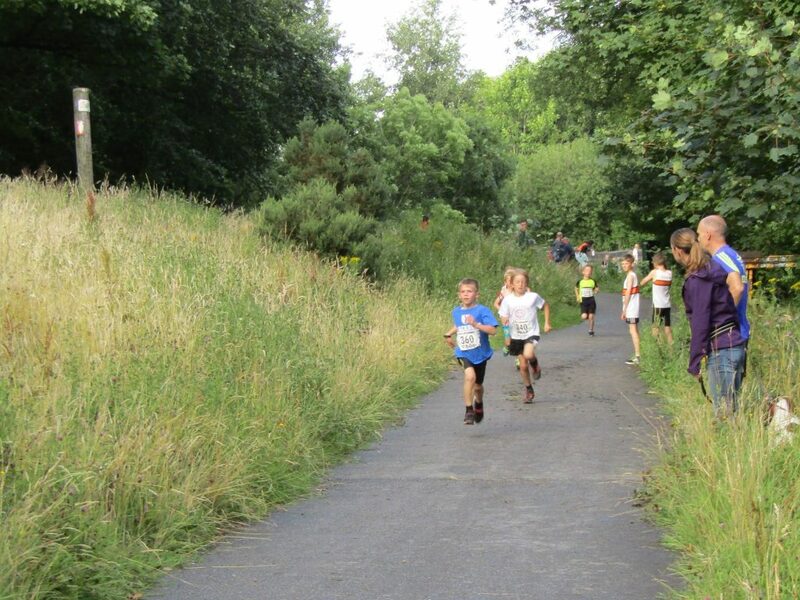 In the Junior U7/U9 Race Felix Thompson had a cracking run finishing 2nd out of the twenty three strong field in a time of 4.01, just four seconds behind the winner Callum Singleton. 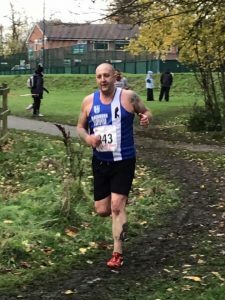 Brother Dexta Thompson just keeps on winning even though at this, his latest race, he was troubled with a dodgy stomach. 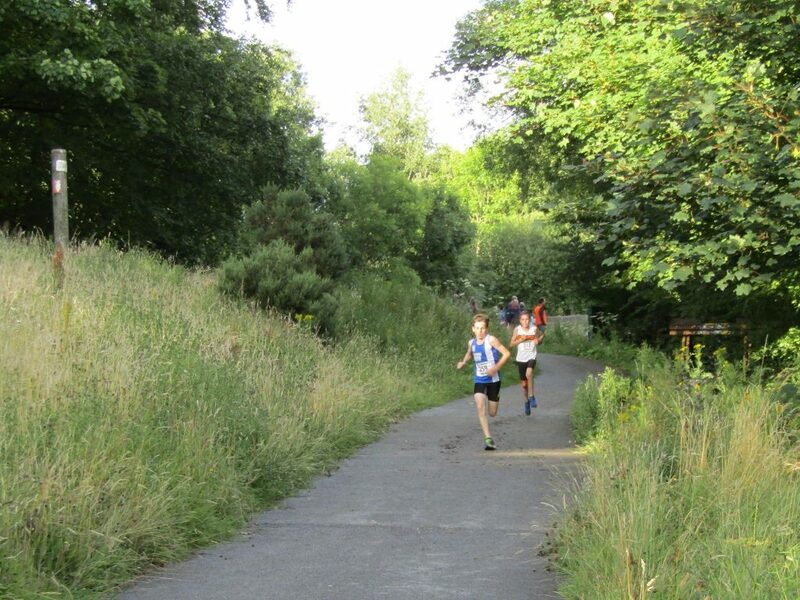 Dexta won in a time of 6.44 to hold of Robbie Smedley in 2nd place. 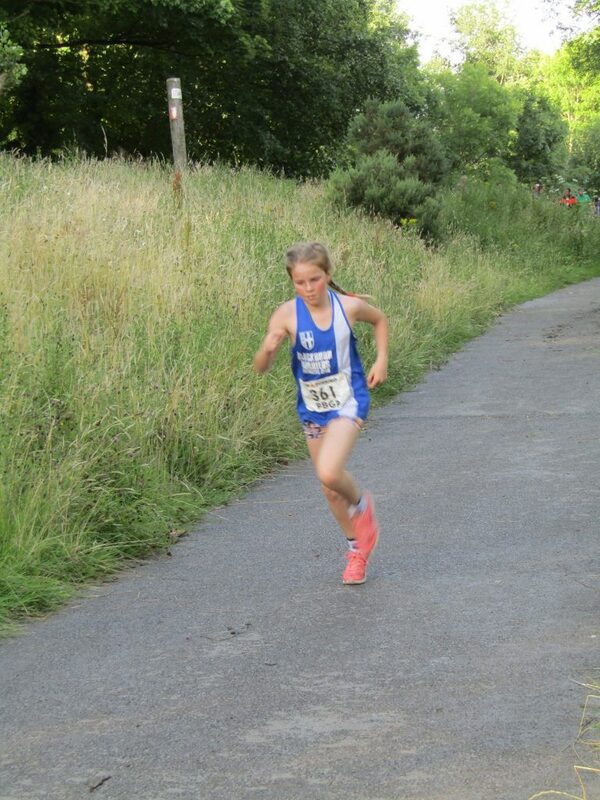 Kady Thompson ran in the same race to finish 5th girl out of 10 and 31st overall with a time of 9.05. 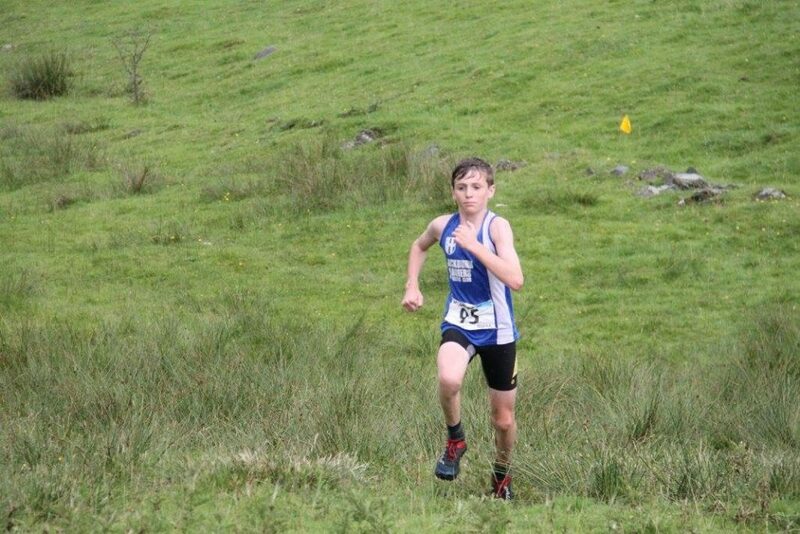 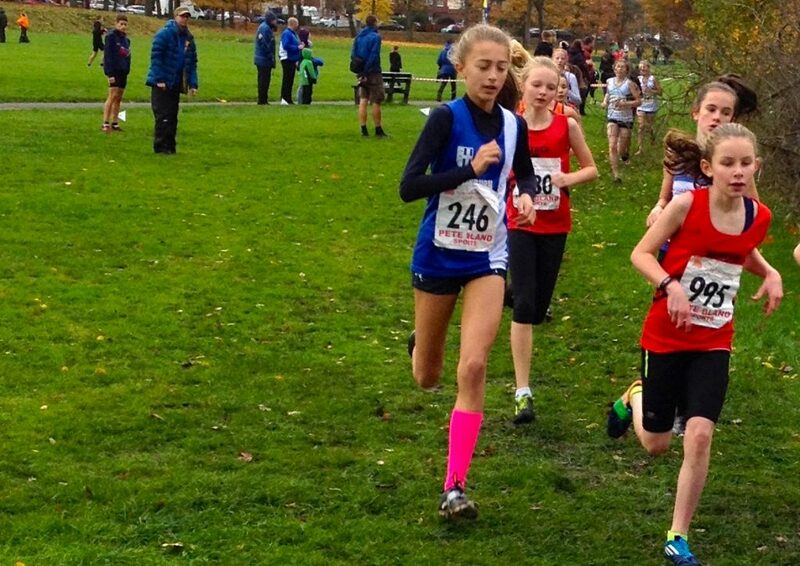 One day later and Dexta Thompson is at it again – this time winning the U12’s Bofra Race at Ambleside. 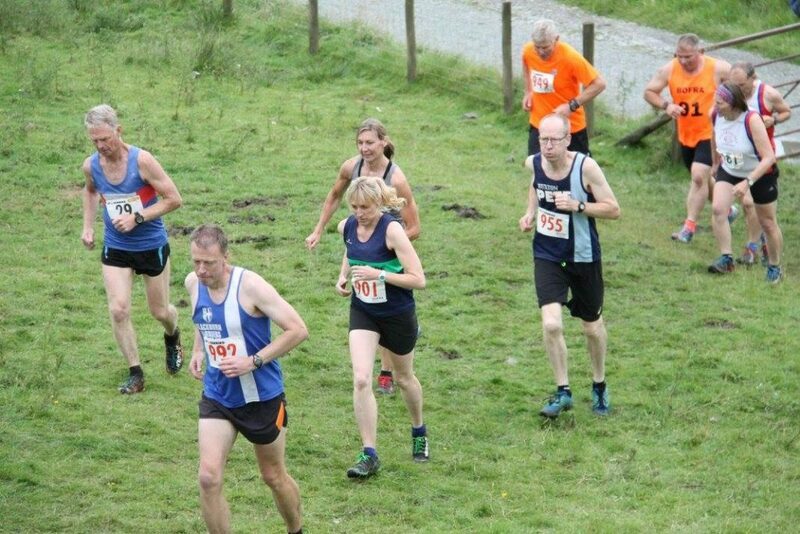 Ninety runners lined up in the mixed race which he won in a time of 8.36 from Charlie Almond (Ambleside AC) in 2nd place. 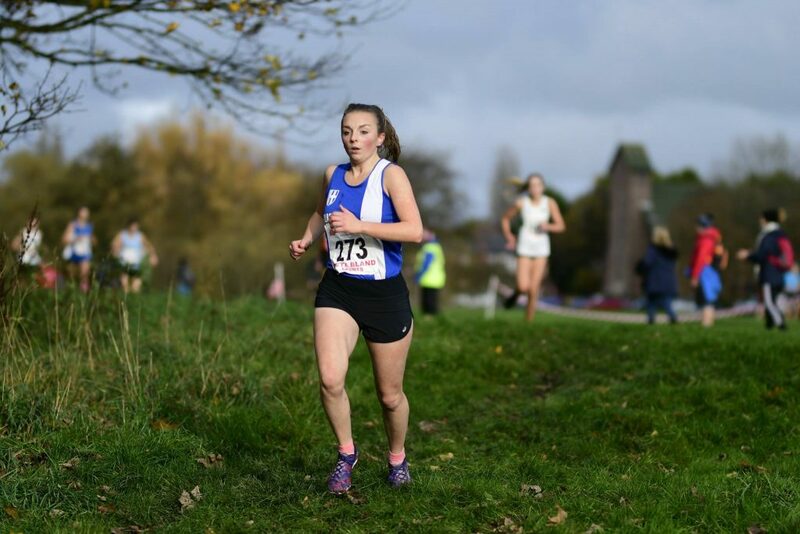 Kady Thompson came home with a time of 13.53 in the Race (76th). 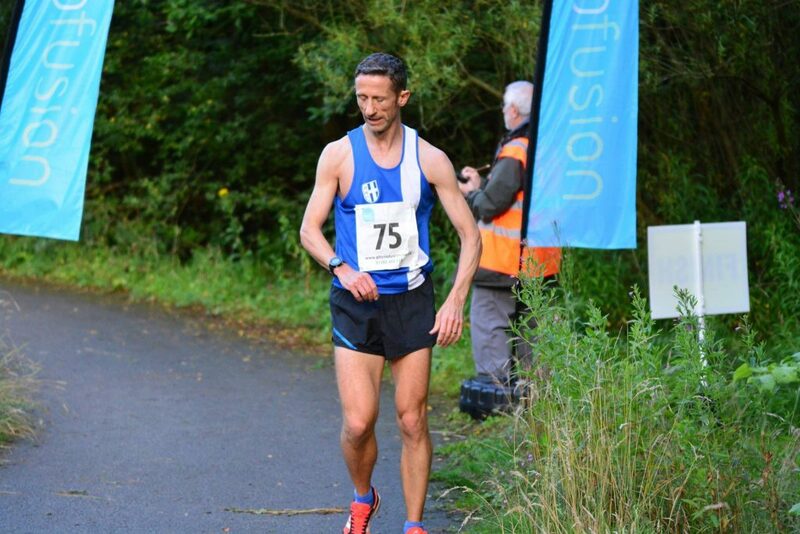 Rob Hope won the Senior Race featuring ninety six runners which saw V50 John Orrell finish in 78th spot (24.06). 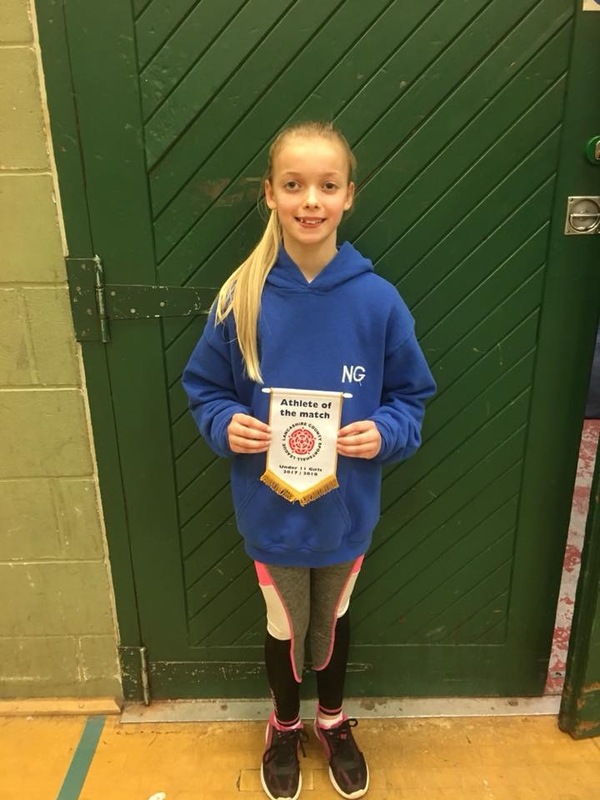 U8 Girl Lulu Sharp came 8th in the 150m in a time of 32.7 – 2nd in the Cricket Ball Throw (10.48m) – 9th in the Long Jump with a distance of 1.81m. 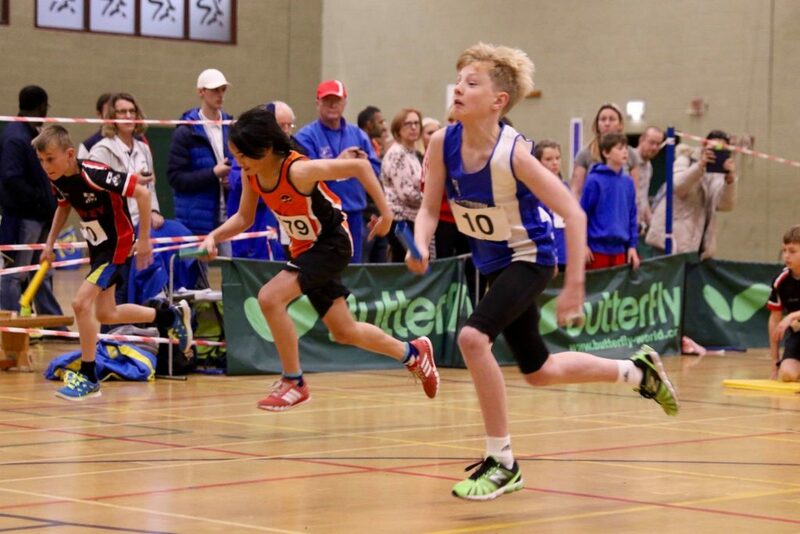 In the U9 Boys Felix Thompson came 3rd in the 50m (9.4) followed by William Bontoft in 4th (10.3). 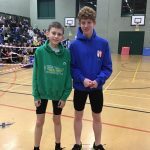 Same two again in the Cricket Ball Throw with Felix 2nd (22.80m) and William 8th (13.18m). 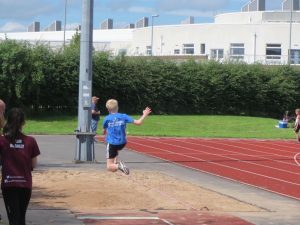 Rounding off the day for these two with Long Jump in which Felix placed 8th (2.42m) and William 12th (1.73m). 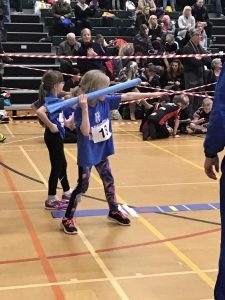 Hannah Davies competed in the U9 Girls events winning her Heat of the 50m in 8.5 – coming 3rd in the Final with the same time of 8.5. 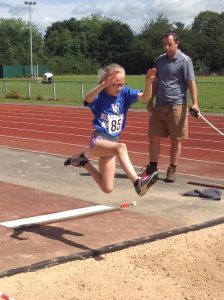 In the 150m she came 2nd in 26.0 and finished her day with a 3rd placed jump of 2.66m in the Long Jump. 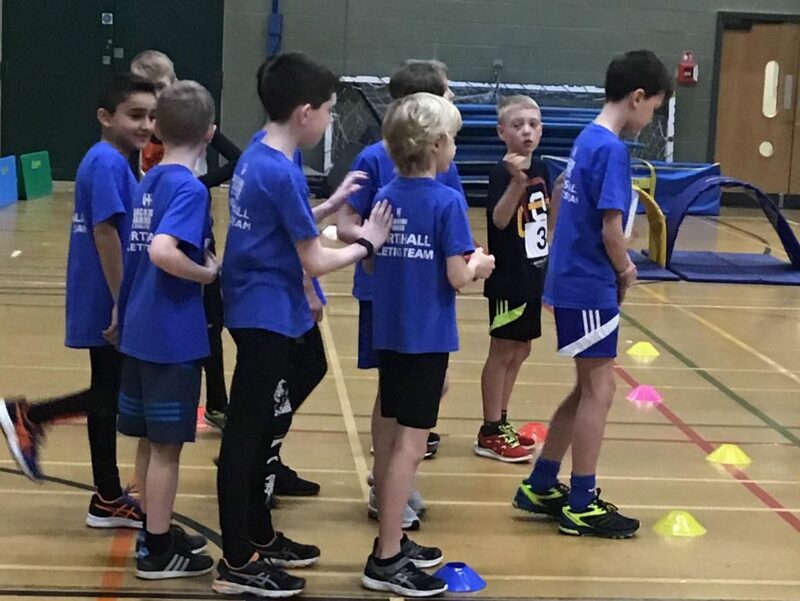 The U10 Boys were represented by Matthew Smith who won his Heat of the 75m in 11.8 with Jack Probert 5th in his Heat (14.0), Findlay Carroll 3rd in his Heat (13.2) and Joel Bladon 2nd with a time of 12.3. 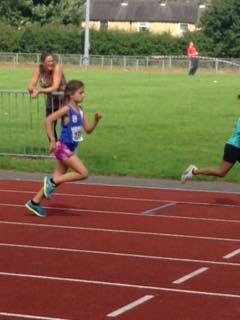 Sienna Wareing came 2nd in Heat (2) of the U10G 75m with Alisha Lehner 2nd in 12.6, Imogen Robinson 3rd (12.8) and Lydia Houghton 5th (13.5) in Heat (3) and Olivia Banks 3rd (13.6), Tippi Francis 5th (14.5) in Heat (4). 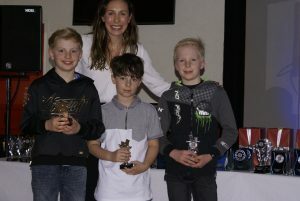 Back with the U10 Boys and it was a win for Matthew Smith in the 600m (2.01.4) with Findlay Carroll 8th in a time of 2.15.3. 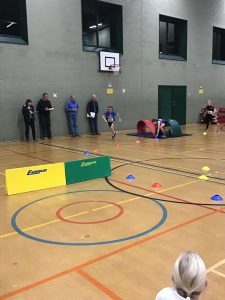 In the Cricket Ball Throw – Findlay Carroll took 3rd place with a distance of 26.20m followed in 4th spot by Jack Probert (25.29m). 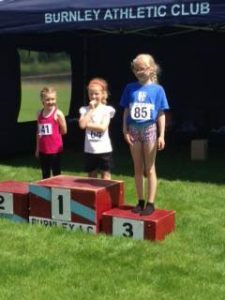 Sienna Wareing won the Cricket Ball Throw for the U10 Girls reaching 18.35m and she was backed up in 2nd place by Alisha Lehner (15.40m), Olivia Banks (6th) with 13.17m and Lydia Houghton in 9th (10.63m). 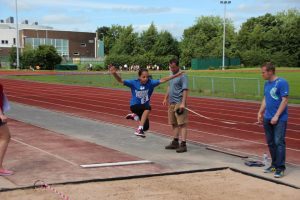 In the Long Jump Matthew Smith added to his very good day with a 3rd in the Long Jump (3.60m) with Joel Bladon in 9th (3.05m) and Jack Probert 19th (2.42m). 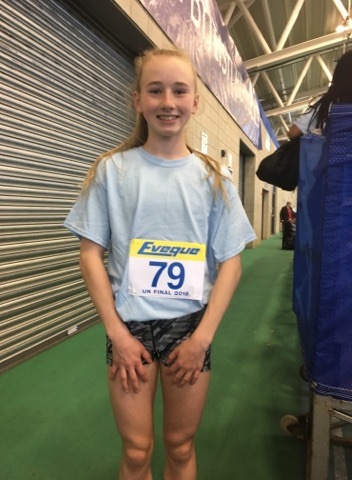 In the U10 Girls Long Jump Alisha Lehner placed 11th with a jump of 2.70m, Imogen Robinson (12th) cleared 2.69m, Lydia Houghton (15th) with 2.28m and Tippi Francis finished in 17th spot with a jump of 1.64m. 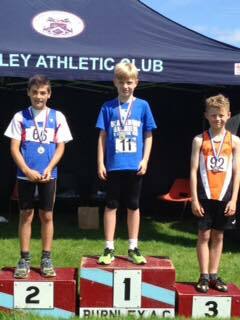 Finishing the day for the U10’s was Joel Bladon who threw 3.24m in the Shot Putt (2.72kg) in 3rd position. 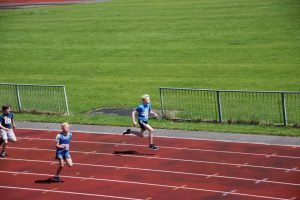 Harrison Allcock and Nathan Ashworth were the U11 Boys representatives which saw Harrison take 2nd place in Heat (2) of the 75m in 10.9 and then ran two tenths quicker in the Final for another 2nd place in 10.7. 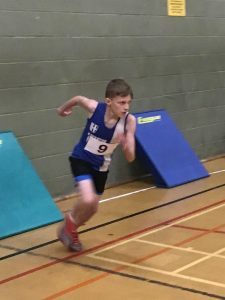 Nathan Ashworth ran a time of 2.15.3 in the 600m (7th) followed by the Long Jump where he finished 10th with 3.00m. 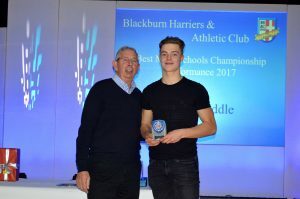 Harrison Allcock won the Long Jump with a distance of 3.80m before finishing 2nd in the Shot Putt (2.72kg) with a throw of 5.14m. 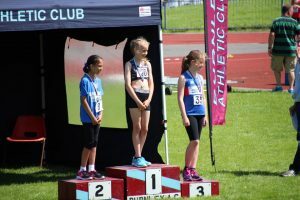 Madison Bontoft won the U11 Girls Shot Putt with a distance of 4.62m. 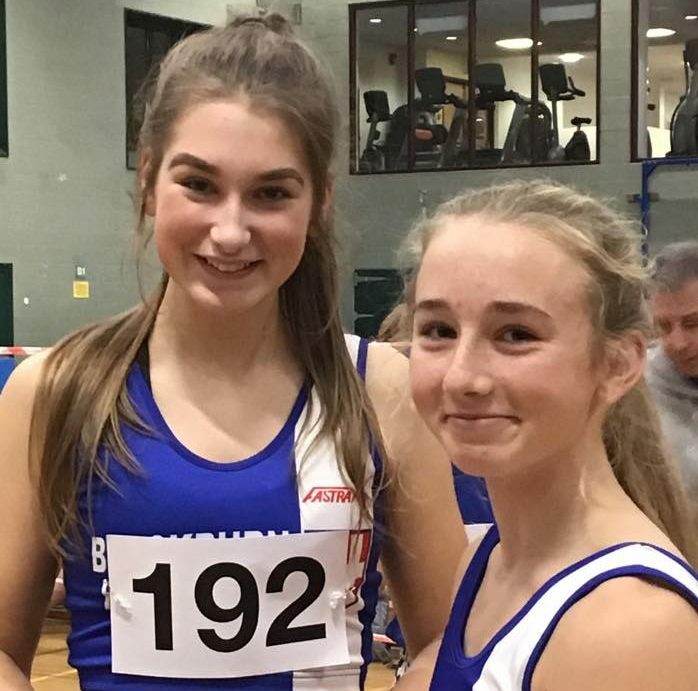 In the Long Jump Kady Thompson placed 12th out of twenty with a distance of 2.95m with Isabelle Hartley in 13th (2.94m), Caitlin Clarkson (18th) with 2.64m and Madison Bontoft 19th with a leap of 2.63m. 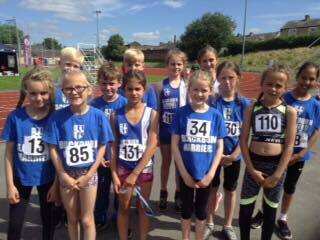 Caitlin Clarkson and Kady Thompson finished 2nd (22.40m) and 3rd (20.77m) with Isabelle Hartley 6th (17.60m) in the Cricket Ball Throw. 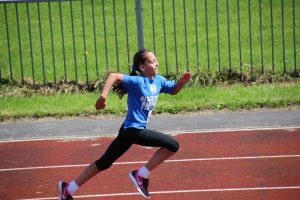 In the 600m Race Isabelle Hartley came 5th out of 16 athletes in a time of 2.06.4.